The subject of this article will be fly fishing for jack crevelle. Jacks are found throughout the world and put up a terrific fight on fly tackle. Jack are the Bulldogs of the inshore saltwater. They use their broad sides and deeply forked tail to pull incredibly hard when hooked. Jacks often times school up in large numbers. This fosters a sense of competition, resulting in them being very aggressive. Jacks also forage on the surface. Casting flies into breaking jacks is great sport! I am a fishing guide in Sarasota Florida. I run around 200 fishing charters a year. Very seldom do I specifically jacks. More often than not, they are incidental catches or targets of opportunity. Jack are often encountered in the same spots as snook. While not the target species, jacks are a most welcome interloper. Such was the case on a recent charter with Greg Cudnik from southern New Jersey. Greg is a good fly angler who owns Fisherman’s Headquarters in Ship Bottom, New Jersey. He also does some charter fishing for striped bass, bluefish, and fluke. Greg specializes in light tackle fishing and fly fishing for the species. It was a foggy Sunday morning during Christmas week. That means that the traffic was going to be heavy as it was a beautiful day that hit 80°. We spent the first half hour hitting a likely shoreline in a creek with an outgoing tide, but with no luck. I was headed to another spot when all of a sudden a small bunch of fish started working on the surface. Greg’s cousin Mike grabbed the spinning outfit with the Bass Assassin Sea Shad jig and grub combo while Greg scrambled for the seven weight fly outfit that was rigged and ready. Mike got is bait in the water first and was instantly hooked up to a fish. By the time Greg got his line stripped out and was ready to go the fish had moved past us. Mike fought the fish well, letting the scrappy 3 pound Jack in several minutes. We held it up for a quick photo, then released it unharmed. Now that we were all set up, I tried to find the fish again. However, after idling in the direction that they were swimming and looking around for several minutes, we did not find them and moved on. After a short “no wake zone”, I jumped the boat up on plane and had not gone for more than half a mile when we saw several more bunches of fish. A couple were in the deeper channel, in 10 foot of water while others were on the shallow flats in a couple feet of water. Since we were fly fishing, we decided to target the shallow fish. After several attempts to get the boat in position, a school of jacks popped up 15 feet away from the boat and downwind. Greg was on the bow with the wind over his casting shoulder and the school of forging fish and easy cast away. He lay the fly out perfectly stripped it several times and a large jack crevelle charge the fly, half of its back sticking out of the water. It was an epic take! Mike was on the stern and had also hooked up, this time using a shallow diving Rapala since we were in only a couple feet of water. Fortunately, the fish went in different directions and it was easy to fight the two fish to the boat. Mike released another 3 pound fish while Greg landed a nicer Jack of around 7 pounds. The action continued for another couple hours with the fellas landing a half dozen fish each. Eventually, the Sunday morning boat traffic put the fish down. However, this is a perfect example of “opportunity fishing”. The plan was to target snook along mangrove shorelines as neither Mike or Greg had ever caught one. The big jacks were a most welcome distraction and an excellent example of why it is important to be rigged and ready and also being flexible on your fishing strategy. 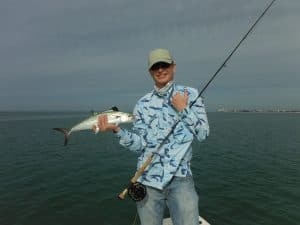 While jack crevelle are available year-round, the most consistent fishing for them here in Sarasota and in most of Florida is in the cooler months. Our fish average 3 to 5 pounds while fish on the East Coast can be significantly larger. 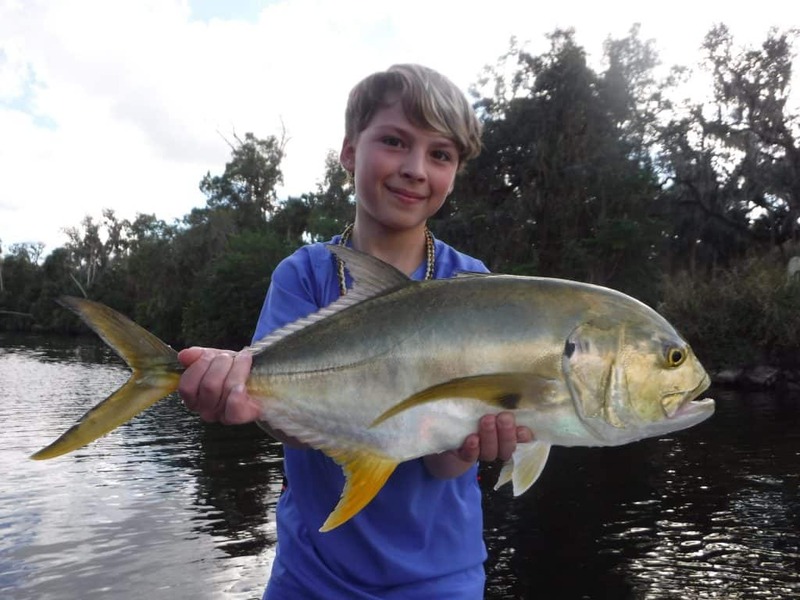 It is not uncommon to run into jacks that are pushing 20 pounds in the inshore waters. Anglers targeting jack crevelle on fly need to adjust their tackle to the fish that are generally found in the area. Greg enjoyed the action using a seven weight outfit. That was borderline for a couple of the larger fish. 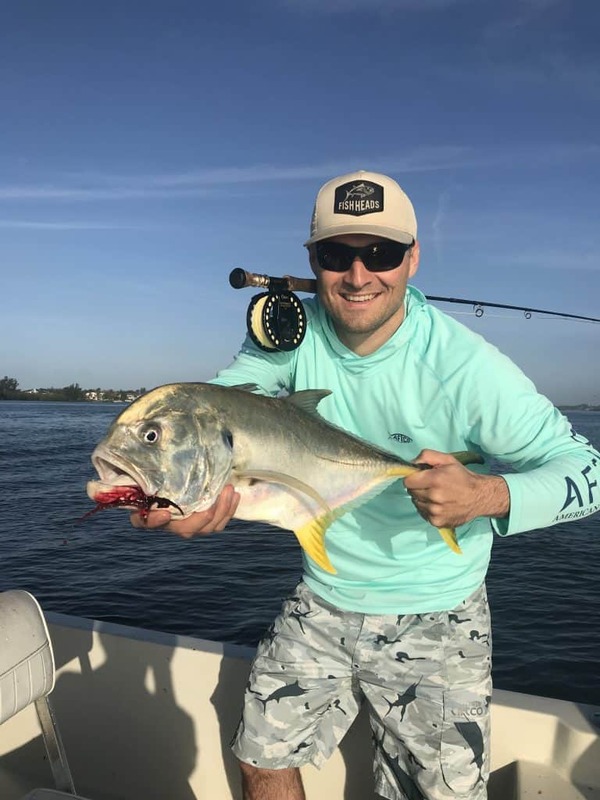 Anglers fishing on the East Coast of Florida and in other tropical destinations where jacks grow large may have to bump the tackle up as high as a 10wt outfit. I prefer to use an intermediate sink tip line for the vast majority of the fly fishing we do in Sarasota. Seldom do we actually target fish on flats in water between one and 2 feet deep. Therefore, an intermediate sink tip line is more versatile. Anglers can begin stripping as soon as it lands and still keep the fly up high in the water column. But, they can also allow it to sink and work the 4 to 8 foot depths where speckled trout, mackerel, and other species are found. Many fly anglers over complicate the leader, in my opinion. I prefer to keep the leader simple. That morning when Greg was catching those jacks, the leader consisted of 4 feet of 40 pound fluorocarbon with another 3 feet of 30 pound fluorocarbon. That, combined with a weighted fly, in this case a Clouser Minnow, resulted in the fly turning over easily. Fly selection is pretty easy when it comes to targeting jacks. Any small bait fish pattern that remotely resembles the forage that are being devoured should elicit a take. In this case, Greg was tossing a green over white Clouser with fairly heavy eyes. Clouser Minnows are by far the most popular fly in this area. A large arbor reel with a smooth drag finishes off the rig. One of the most important requirements when working schools of breaking jacks, or any other kind of breaking fish, is patience. It can get very exciting and sometimes intense as schools of fish erupt on the surface. Jack crevelle tend to move fairly quickly. I have experienced four hour charters where I have followed the same school of fish for several miles in that time span. Other boats working the fish can complicate the situation as well. Successful anglers will resist the urge to go charging into the fish. It is much better to try to determine the direction and speed the fish are heading and then intercept them. One good, quality opportunity is much better than 10 shots that are less than ideal. As mentioned above, the ideal situation is to have the fish blowup a nice easy cast away downwind. When this occurs, the best approach is to cast the fly right to the edge of the school. While the fish are very aggressive, it is possible to spook them by “lining” the fish. This means having the fly line land right on top of them. Also, by plucking a fish off the edge of the school it allows two anglers to work to same school. Finally, doing this will reduce the chance of the leader being caught on the backs of one of the other fish that are in the school. Once the fly lands, a fast, aggressive stripped will usually draw a strike. If the fish are working on the surface, the angler does not need to let the fly sink very far. With the rod tip low, near the surface of the water, the line is stripped sharply with a pause in between. When the take occurs, the line is pulled tight with the stripping hand and then the rod tip slowly raised. This is called a “strip set” and is used with most streamer fishing in both fresh and saltwater. Just because the fish are not feeding on the surface, do not assume that they have gone. Greg hooked a couple of his fish by casting into the area where the jacks had been recently seen. In this case, it is best to let the fly sink for several seconds before beginning the retrieve. Once a Jack is hooked, if it is of any decent size, the angler will soon be “on the reel”. This means that all the loose fly line will be gone from his or her feet and the fish can be fought using the rod and reel. As the fight nears the end, it is important not to “high stick” the fish. This means raising the fly up high putting it in a severe arch. Many a fly rod has been broken by a large fish close to the boat, particularly in deep water. The best technique is short pumps of the rod while taking up the slack with the reel. Anglers should try to keep the fly rod below the horizon. This not only gives the angler more power, but it will drastically reduce the chance of breaking your favorite fly rod! There is one situation where I do target jacks and that is in creeks, rivers, and canals in the winter. Jacks are a subtropical species and do not tolerate water temperature much below 60° for very long. Severe cold fronts will drop the water on the shallow flats as much is 10° in a couple days. However, the water and residential canals, creeks, and rivers is often significantly warmer. This will result in jacks as well as snook migrating into these areas, particularly if were having a cool winter. One advantage to this type of fishing as that the fish become concentrated. These are relatively small areas, all things considered, especially if the tide is low. Winter is the dry season as well here in Florida. That means that most rivers will be fairly low. Jacks and other game fish will be concentrated in the holes and deeper sections of the rivers and creeks. While jacks will occasionally forage on the surface in these areas, the vast majority are caught by anglers blind casting. For whatever reason, jacks in these backwater creeks and rivers just tend to not feed on the surface as much. However they do feed and remain aggressive. Also, once a productive area is located, multiple fish can usually be caught. The Braden River in particular is a terrific spot to target jack crevelle from December through March. It is a small river and is a tributary of the Manatee River, which can also be very productive. The Braden River is quite close to Tampa Bay. 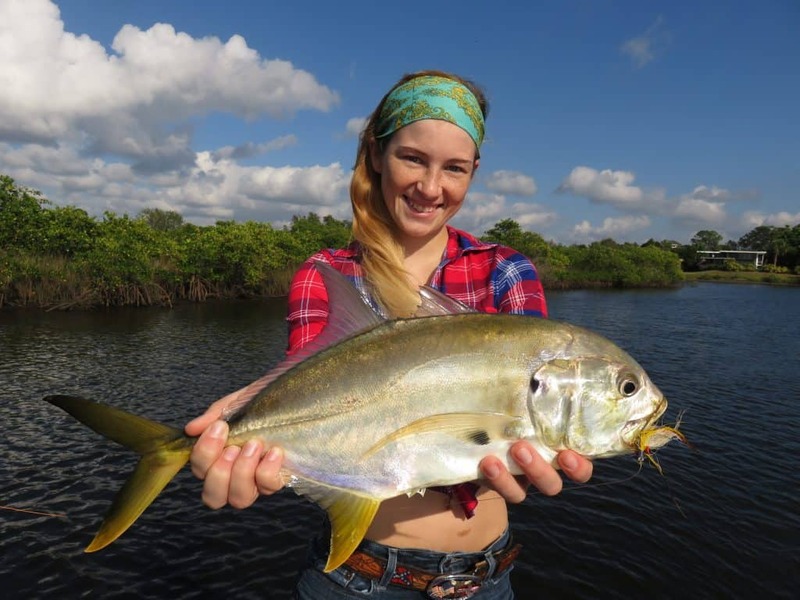 Jacks that spend their summer on the open flats of Tampa Bay move into both rivers in the winter to seek the warmer water and available forage. As an added bonus, snook, redfish, juvenile tarpon, and other species are available as well. In conclusion, anglers who enjoy the long rod should give fly fishing for jack crevelle a try. Just as Greg did, I bet you will gain a newfound respect for these awesome game fish! Anglers fishing Siesta Key have many different species that they can target. Siesta Key offers inshore light tackle sport fishing all year long. Multiple techniques and spots will produce some great catches! 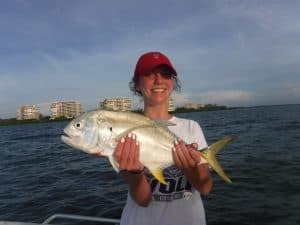 The best way to experience the diverse fishing options that Siesta Key offers visiting anglers is to go out on a Siesta Key fishing charter. 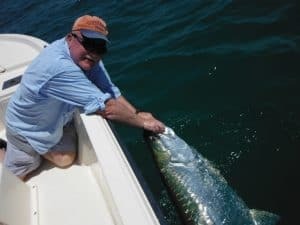 Capt Jim Klopfer has been guiding clients since 1991 and knows the area and seasonal fish migrations well. He supplies everything needed and will cater the fishing charter to his clients expectations. Most hobbies require specialized equipment, and fishing is no exception. Fishing equipment basically consists of rods and reels, line, the terminal tackle, and some tools and accessories. The best choice for the majority of anglers fishing Siesta Key is spinning tackle. Spinning tackle is easy to used and a decent outfit can be purchased for around $100 many anglers grew up freshwater fishing using spend cast tackle. This just does not hold up and saltwater. Conventional or bait casting tackle certainly has applications and saltwater fishing. These outfits are primarily used by anglers casting heavier lures or when trolling or bottom fishing offshore. The best choice for anglers fishing Siesta Key in the inshore waters is a 7 foot medium action spinning rod. This rod should be mated with a 3000 series spinning reel. There are many different manufacturers who make quality equipment. A local bait and tackle shop will give a better recommendation than will one of the bigger box stores. Penn, Shimano, and Diawa are all popular brands. There are many different fishing lines to choose from. The primary lines are braided line and monofilament line. Like most things in life, both have advantages and disadvantages. Monofilament line is easier for beginners to use. It is less expensive and knots are easier to tie. However, monofilament line stretches and will twist. Braided line cost more and knots are more difficult to tie. However braided line has no stretch and will last a very long time. Braided line has a smaller diameter and generally speaking cast further than monofilament line. Anglers using braided line must have good line control skills. Braided line will loop and not up. Once that not is drawn tight, it is very difficult to remove. Terminal tackle consists of any hooks, lures, leaders, swivels, weights, or floats that are attached to the end of the line. We will cover each of these individually. Hooks come in a myriad of sizes and shapes. Once again, to the novice angler this can seem overwhelming. However, it is really fairly simple. A selection of live bait hooks in sizes #2, #1, and #1/0 will cover most angling situations. #1/0 long shank hooks work well when toothy species such as Spanish mackerel and blue fish are around. The long shank will help reduce cutoffs. Once in a while, a larger hook such as a #4/0 will be required when using a large live bait or large piece of cut bait. Circle hooks are required for anglers fishing in the Gulf of Mexico. This basic selection of hooks is all that is required for anglers fishing Siesta Key. Shock leaders are required when fishing and saltwater. Many fish have teeth and most have some type of raspy jaws. That requires a leader that is a bit heavier than the running line to help prevent fish from cutting off. 30 lb test is a good all-around leader strength. 24 inches is a good leader length as anything longer than that can make it difficult to cast. Leaders can be attached to the mainline with a line to line not such as a double Uni Knot or by using a small black swivel. Sinkers are used to get the bait down to the bottom. Once again, sinkers come in many different sizes and shapes. Anglers fishing Siesta Key only need two types of sinkers; egg sinkers and split shot. Egg sinkers are around and shaped like an egg with a whole running through the center. The running line is slid through this hole before the leader or hook is tied on. A selection of egg sinkers between 1/4 ounce 21 ounce is all that is required. Split shot are small sinkers that way very little and are pinched on the line. Floats are often used by anglers fishing Siesta Key. They’re often times referred to as corks. Floats and saltwater fishing accomplish two things. They suspend the bait up off the bottom while giving a visual reference to when a fish takes the bait. Corks also are used to attract the fish. Noisy corks are used to simulate fish feeding on the surface. This will draw game fish to the bait suspended below. Artificial lures can be very confusing to the novice angler. While it can be daunting staring at a rack full of lures, they fall into several categories. The three types of lures used most often by Siesta Key anglers are jigs, plugs, and spoons. Artificial lures will often times out fish live bait. The key is confidence and choosing the proper lore and presentation. A jig is a simple lure that is very effective. It is probably the oldest artificial lore used by man. A jig is basically a hook with a lead weight molded and near the eye. This provides casting weight along with giving the lure it’s action. The lore will hop and fall in the water column thus the name “jig”. The hook is adorned with some type of dressing such as bucktail or synthetic care or a plastic grub body that mimics a shrimp or bait fish. A spoon is a curved piece of metal with a hook at the end. Most spoons used by saltwater anglers have a metallic finish, either silver or gold. Spoons can be cast a long way and have a terrific action. They wobble and flash in the water, mimics an injured baitfish, thus attracting game fish. Most spoons have a trouble hook and are used in open water. However, other spoons are designed with a single hook that are relatively weedless and are used in shallow water. Plugs are plastic lures that imitate small bait fish. Plugs are very effective but have a couple of drawbacks. They are fairly expensive, averaging around $10 apiece. Also, most plugs have treble hooks. That makes them more dangerous when casting and when unhooking a fish. However, when used with caution they are extremely effective lures. They can be cast or troll to catch fish. Live bait is the best choice in most instances for anglers just getting started fishing Siesta Key. Shrimp and bait fish are the two predominant baits in this area. Shrimp are the most versatile as every fish and saltwater eats them. They can be purchased at all local bait shops. Shrimp are fairly easy to keep alive in a bait bucket with and aerator. Fresh dead shrimp can be very effective for bottom fish as well. Live bait fish are bit more complicated. While they can occasionally be purchased at bait shops, in most instances anglers will have to catch their own. Bait fish come into separate categories. Pin fish and grunts are a bait fish that is similar to freshwater bluegill. The other type of live bait fish are one of the family of small shiny fish such as scaled sardines or threadfin herring. The rig for using live bait is simple. Anglers tie on a number 10 black swivel to the mainline. A 24 inch piece of 30 pound fluorocarbon leader is tied onto the other end of the swivel. A live bait hook finishes off the rig. #1/0 is a good all-around size when fishing for most game fish. Anglers targeting smaller bottom fish off the beaches are around structure will use a #2 hook. Live shrimp are hooked either under the horn near the head or through the tail. The hooking location really depends on the species being targeted. Game fish such as trout, snook, mackerel, and others prefer a shrimp hooked in the horn. This allows the shrimp to swim naturally in the water. Bottom fish are less particular. Often times, threading the shrimp on the hook is the best approach. Live bait fish are hooked under the dorsal fin or through the nose. Live baits can be either free lined, fished under a float, or fished on the bottom. The technique used depends in most cases on the species being targeted. Anglers fishing the shallow flats will use a court to keep the shrimp suspended up off the bottom. In deeper water, over 6 feet or so, free lining the shrimp works better. At times a small split shot may be required to keep the bait down. Anglers bottom fishing slide and egg sinker onto the running line ahead of the swivel. The popping cork rig is an extremely effective technique for anglers fishing Siesta Key. It is likely that more speckled trout have been landed using a popping cork in a shrimp then with all the other fishing methods combined. The cork is placed 3 feet above the hook. The rig is cast out and allowed to settle. The rod tip is then sharply twitched. This causes the court to make noise which will attract speckled trout and other game fish to the helpless shrimp. Free lining a shrimp works very well. This method is employed when fishing water deeper than 6 feet or so. The shrimp looks very natural swimming in the water with little or no weight. Anglers can free line a shrimp out behind a drifting boat. They can also anchor and cast the shrimp to an edge or drop off. Anglers fishing from the surf will add a split shot or two and allow the shrimp to swim naturally in the surf. Bottom fishing is a very simple and effective technique for anglers fishing Siesta Key. Many fish live on the bottom and relate to structure such as rocks, bridges, docks, ledges, and oyster bars. Since fish live and feed on the bottom, presenting a bait there is going to be productive. Bottom species such as sheepshead, snapper, grouper, drum, flounder, and more are all taken by Siesta Key anglers. The key to bottom fishing is getting the bait down to the bottom while still having a natural presentation. Anglers should use just the amount of weight to region hold bottom. Depth and current flow are the primary factors in determining this. If the sinker is constantly bouncing on the bottom, eventually it will snag. The main obstacle beginning anglers will have to overcome when using artificial lures is confidence. Once an angler start catching fish on lures, they will gain confidence and resist the urge to want to switch back to live bait many times, artificial lures catch more fish than live bait. The main advantage of artificial lures over bait is that lures cover a lot more water. Anglers are constantly casting and retrieving them. Lures will trigger strikes from fish that are not hungry but will strike out of reflex. Finally, lures are more convenient as there is no bait to keep alive along with less mess. Most popular lure for anglers fishing Siesta Key is without a doubt the jig and grub combo. 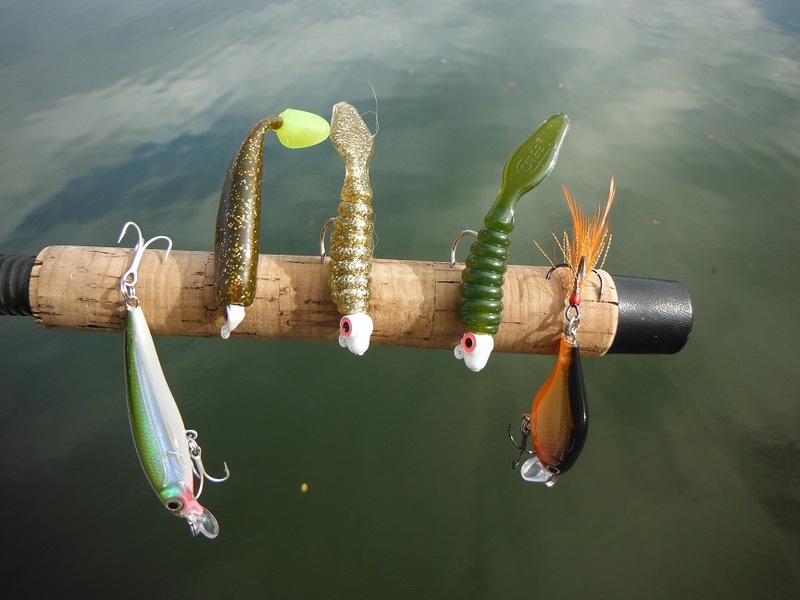 These lures are very versatile, effective, and relatively inexpensive. Jig heads come in many colors and sizes. Red and white are the most popular colors and one quarter ounce is the best all round weight. 1/8 ounce jigs are used in shallow water. A plastic grub of some type is then hooked on to the jig. Grubs are designed to imitate either bait fish or shrimp and other crustaceans. Again, anglers have many different sizes and colors to choose from. However a selection of 3 inch to 4 inch shad tail and shrimp tail baits in gold, white, root beer, and chartreuse will get the job done. Jigs can also be purchased that come with a synthetic fiber or buck tail dressing. Buck tail jigs have been catching fish for a long time, with white being the best color. Pompano jigs work well and usually come with synthetic care. They generally have a much shorter dressing as pompano have a small mouth. The main disadvantage of hair jigs is their lack of durability when catching saltwater fish. Passes and inlets can be great spots to use jigs. Most passes have shallow bars and deep channels which will hold fish. Vertically jigging works very well in the deeper water. The angler simply drops the jig down to the bottom and bounces it up in short 1 foot hops as the boat drifts along. Pompano jigs work very well in this application. Each time the jig hits bottom, it kicks up a puff of sand, imitating a crab. Jigs are cast out and retrieved on the shallower parts of the pass. Jigs are extremely productive on the deeper grass flats. These are submerge grass beds in water between 6 feet deep and 10 feet deep. Speckled trout, bluefish, Spanish mackerel, Pompano, flounder, and other species will take a jig. The jig is cast out and retrieved back to the boat, using a sharp twitch of the rod tip. Most strikes will occur as the bait is falling helplessly through the water column. Spoons are another lure that are effective on a variety of species. Spoons are very easy for the novice angler to use. They cast a long way and have a great built in action. Anglers can retrieve steadily or use a “twitch and pause” retrieve. A swivel must be used when using spoons otherwise line twist will be an issue. Spoons are especially effective when fish can be seen feeding on the surface. Spoons also work very well for anglers who troll. This is another very simple technique. The spoon is simply cast out behind the boat, then the boat is idled along in search of fish. This is a great way to locate fish over a large area. 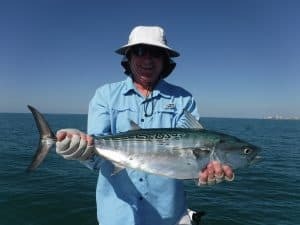 Anglers targeting king mackerel in Spanish mackerel use a special trolling spoon which is designed to be pulled at a fairly brisk pace. Plugs catch a big fish. Plugs are more expensive, the trouble hooks require caution, and they generally produce fewer strikes. However, they seem to catch bigger fish. Plugs come in two basic styles; floating and subsurface. Floating plugs, or top water plugs, stay on the surface while being retrieved. Subsurface plugs float on the surface then dive down when retrieved. The size and shape of the lip on the plug determines the depth and action. Top water plugs come in two basic styles; walk the dog baits and poppers. Poppers are the easier of the two to fish and are very effective. These are floating baits have a concave face. The lore is cast out allowed to settle, then the rod tip twitched sharply. This causes the face of the Lord to dig into the water, making a loud pop. Walk the dog baits are a bit more difficult. The venerable zero spook is an example of this type of bait. The rod tip is held near the surface and a rhythmic twitching results in the lure dancing back and forth seductively on the surface. A common mistake many anglers make when using top water plugs is working them to quickly. This is especially true on a calm sea. Generally speaking, a slow subtle action will draw more strikes. Striking too soon is another mistake that is easy to make. The sight of a large fish blasting a top water plug is thrilling! However, it is necessary to feel the weight of the fish for setting the hook. Also, a smooth sideways sweep of the rod tip is not only more effective, it is much safer. No angler once a plug with multiple treble hooks flying back into the boat! While top water fishing is exciting, more fish are caught on diving plugs. These lures float on the surface and dive down several feet when the retrieve is begun. The plastic lip on the front of the plug determines the depth and action of the plug. However, speed and line size will affect the depth as well. The best plugs for anglers fishing Siesta Key dive down 3 to 5 feet in the water column. Suspending plugs work well over the deeper grass flats. The MirrOlure is the most popular local example of that. These lures sink slowly when cast out, roughly a foot per second. They are retrieved back using a sharp twitch. The lore will jerk forward then hover there seemingly helpless. This is an especially effective bait for speckled trout. Trolling plugs is a great way to locate fish in a large area. It is also a great tactic with novice anglers and children. As long as they can hold rod, they can catch a fish! Trolling works well in the inshore bays, passes, and in the Gulf of Mexico. A #8 Rapala X-Rap in white or olive is a good lower to troll. The technique is very simple. The plug is dropped alongside the boat with the bail open. As the boat idles forward, the angler counts out to 15 or so. The bail is angler’s and the boat simply idled around at a slow speed. When a fish hits, there is no mistaking. This is extremely effective for Spanish mackerel is a like a fast-moving lure. Trolling and casting plugs works very well in the inshore Gulf of Mexico as well. Plugs are cast to fish that are seen breaking on the surface. These are fish that have trapped smaller bait fish up against the surface and are feeding on them aggressively. A plug that is cast into this melee and retrieved back quickly will almost always draw strike. On days when fish are not seen feeding on the surface, trolling can help locate them. Several different approaches can be used successfully on the deep grass flats. Large expanses of grass are most efficiently fished by drifting. Smaller patches can be worked from an anchored boat. This is especially true of a flat that drops off quickly into deeper water. Anglers fishing Siesta Key do well drifting the deep flats while casting artificial lures. This is extremely popular and very effective. The major benefit of this technique is that it allows anglers to cover a lot of water. This is important on the larger flats is anglers can eliminate unproductive water in a short amount of time. The lead head jig and grub combo is a very effective lure for doing this. Anglers can certainly cast plugs and spoons as well. Both cast a long way and have a great built in fish catching action. The MirroLure MirroDine is an excellent suspending plug. A 1/2 ounce silver or gold spoon with a single trouble hook is the best all round choice for drifting the deep grass flats. Live bait is also extremely effective while drifting the deep grass flats. A live shrimp under a popping cork is tough to beat in water between 4 feet deep and 6 feet deep. The idea is to have the cork 3 to 4 feet above the shrimp. This allows the shrimp to hover just over the top of the submerge grass. It can get a little cumbersome fishing a popping cork in water deeper than 6 feet. Free lining a shrimp works very well in water deeper than 6 feet. The shrimp is hooked through the horn then cast out behind the drifting boat. As the boat moves along, it brings the shrimp along as well at a natural pace. Breezy days may require a split shot or two to keep the shrimp down in the water column. Live bait fish can be used on the deep grass flats as well. Pin fish and grunts will require a float, otherwise they will get down in the grass. Smaller bait fish such as pilchards and herring can be free lined behind the boat just as a shrimp is. In the summer time, anglers use a very effective technique called “live bait chumming”. This is a bit of a specialized technique. Anglers use a cast net to catch several hundred small shiny bait fish such as scaled sardines or threadfin herring. The boat is then anchored in a likely spot and handfuls of the live bait fish are tossed out behind the boat. This will attract game fish in short order. Hooked baits are then tossed in with the chum and the action begins! Many anglers are surprised to learn that the largest fished oftentimes live in the shallowest of water. These larger fish are generally loners where as the fish on the deeper flats are schooled up. However, a big fish in shallow water is very difficult to catch. Anglers need to be patient and stealthy. Artificial lures are most often used as a can be difficult to fish live bait in very shallow water. However, a large shrimp or live bait can be used under a float or fished in a hole. Jigs, plugs, and spoons are all effective for fishing the shallow grass flats. A 1/2 ounce gold weedless spoon has been used successfully for decades. It can be cast a long way, is relatively weedless, and is especially deadly on redfish. Jigs can be used effectively, though anglers need to go down in size. 1/8 ounce and 1/16 ounce jig heads with a soft plastic body work best. The the jig will ride with the hookup, reducing snags. Anglers casting plugs will have to use surface plugs in most instances. Fish may be located anywhere on the shallow flat, however certain areas will consistently hold fish. Oyster bars, potholes, (these are small depressions in a flat), and mangrove shorelines are all good spots. Deeper water around the bars and shorelines will make them more attractive to game fish. Waiting can be very effective as it allows anglers to make less noise than a boat. It is an undeniable a fact that fish love structure. Structure provides cover and attracts forage such as crustaceans and bait fish. Just about all inshore species will relate to structure at one point or another. 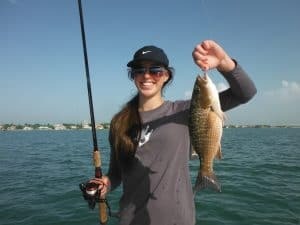 Anglers fishing Siesta Key will target sheepshead, snapper, flounder, gag grouper, redfish, snuck, Jack Gravelle, black drum, and more. 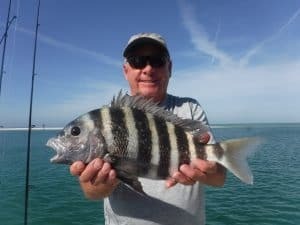 Sheepshead are very reliable in the winter and early spring and are the staple of bottom fishing anglers and Siesta Key. Structure in the passes as well as docks and bridges near the passes will hold these tasty saltwater pan fish. Sheepshead often bite when the water is cold or dirty and other fish are shut down. Siesta Key has countless docks along at shoreline and in its residential canals. Bridge pilings and dock pilings and 4 feet of water to 12 feet of water are the most productive. The best approach when fishing docks and bridge pilings and the shallower water is to anchor up current a cast away. Then, the bait can be cast towards the dock or bridge pilings. Oyster bars are not to be overlooked a structure. Any oyster bar that drops off into four or 5 feet of water can hold fish. Snook, redfish, sheepshead, jacks, and other species will stage in the spots. The boat is quietly anchored a long cast away from the bar to avoid spooking fish. Free lining a live shrimp or pilchard is most productive technique. Higher tide stages are usually best. 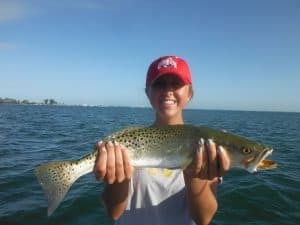 Anglers fishing Siesta Key beaches can experience world-class action and the spring and again in the fall. Huge schools of bait fish will move through on their annual migrations. Larger pelagic game fish will be hot on their trail. The primary species are king mackerel and Spanish mackerel, along with false albacore. However, cobia, sharks, and even tarpon will also be encountered. Ideal conditions for fishing the inshore Gulf of Mexico are calm seas in clear water. Easterly breezes will result in these conditions. This is especially true in the fall when we get many days in a row of high-pressure which equates to Northeast winds. This type of fish and gives anglers the chance to catch a very large fish quite close to shore. There are several techniques that anglers use in pursuit of these game fish. The most exciting technique, when the situation arises, is to cast to breaking fish. These are fish that are feeding aggressively on the surface. They have rounded up schools of forage and have them trapped up against the surface of the water. Fish can be seen feeding birds can be seen diving. Light to medium action spinning rods are perfect for this type of fishing. Small plugs, spoons, and jigs will all produce. Basically, anything that closely resembles the baitfish that they are feeding on will draw a strike. False albacore can be a tad bit fussy, though. When they are feeding on tiny glass minnows, a small offering is required often times. Also, anglers may need to drop the leader down to 20 pound test in clear water. Patience is required for this type of fishing. Instead of charging around from school to school, anglers will do better to set and wait for a good opportunity. Charging into schools of breaking fish usually just puts them down. It is better to sit back and try to get an idea which way the fish are moving, then position the boat to intercept them. Fly anglers are certainly not left out of the action! 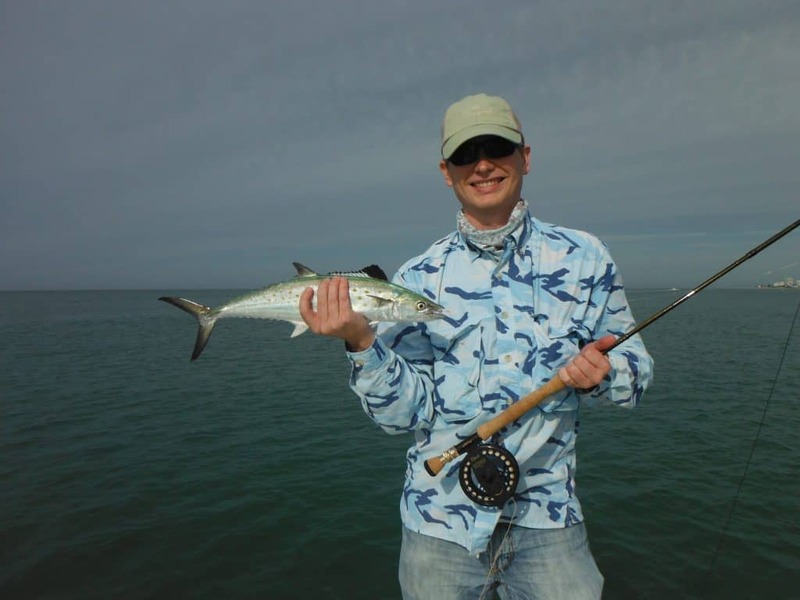 Long casts are normally not required, especially when targeting Spanish mackerel. These fish are hungry and aggressive. Spanish mackerel between 2 pounds and 4 pounds put up a great fight on an 8wt outfit. Anglers targeting false albacore will do better to bump up to a 9wt. Small, white baitfish patterns such as Clouser Minnows and Glass Minnows work well. Trolling is an extremely effective technique that can put a lot of fish in the boat quickly. It is very efficient when a school of fish is located. Often times, fish will not be seen working on the surface. Trolling is an excellent way to locate them. Plugs worked well when trolled back behind the boat, as do spoons. Serious anglers use planers and trolling spoons when targeting king mackerel Spanish mackerel, and false albacore. This type of fishing is a bit more involved. Planers are devices that dive down into the water when the boat is moved forward. Different size planers are used along with different sizes to achieve varying depths. When a fish hits, the planer trips. This results in the angler fighting the fish without the drag of the planer. Live bait can certainly be used successfully as well. One very effective method is to slowly troll a large live bait for king mackerel. A stinger rig is used. This is a wire rig about 3 feet long with two treble hooks. The bait is hooked through the nose with the top hook in the second hook swings free. This is often the hook that catches the fish. Anglers can also free line smaller shrimp and bait fish for Spanish mackerel and false albacore. There are three artificial reefs between Big Sarasota Pass and New Pass. 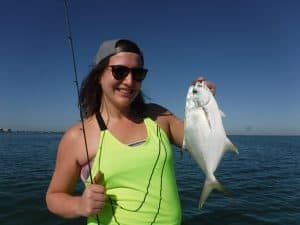 Anglers fishing Siesta Key catch many different species all year long on these reefs. Pelagic species are available in the spring and the fall. 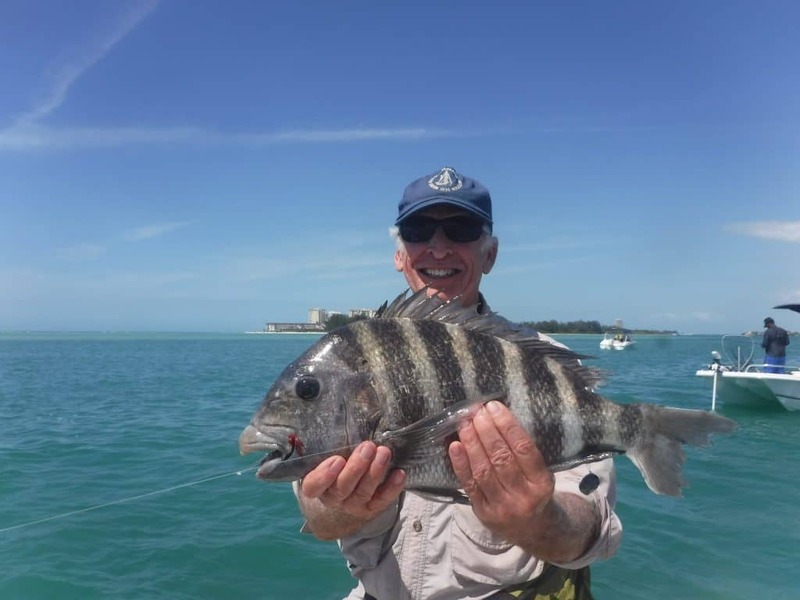 Large spawning sheepshead are caught in February and March. Snapper and grouper are present all year long. These three reefs are within 2 miles of the beach and are great spots to fish when the seas are calm. Winter fishing on Siesta Key is for the most part determined by the weather. Severe fronts move through every week or so. The day of the front is usually not fishable due to high winds. Water will be turned up for the couple days afterwards. However, the water will settle in warm up and action on the flats will improve. As another front approaches, the when will turn south, sometimes blowing hard. The key to success for anglers fishing Siesta Key in the winter is understanding how this cycle affects the fishing. Sheepshead are plentiful and winter around docks, rocks, seawalls, bridges, and other structure. Anglers fishing with shrimp on the bottom will catch these tasty fish along with black drum and other species. Sheepshead fishing is less affected by the weather than are other types of fishing. The only real consideration anglers have is to find some shelter from the wind, if it is blowing. Strong winds will turn up the water in the Gulf of Mexico. This will result in the water in the passes and on the flats being dirty. 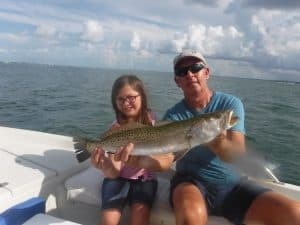 Anglers targeting speckled trout, ladyfish, and other species on the flats will do best getting away from the passes and trying to find cleaner water. The flats along the east side of Siesta Key in Roberts Bay and little Sarasota Bay are often good spots. After couple days, the water will begin to clear up and settle down. Both passes should be productive. The deep grass flats near the passes will also resume decent action. Most of the fish on the flats are in deeper water this time of year. Submerge grass beds between 7 feet deep and 10 feet deep are prime spots. Speckled trout and ladyfish can often be found in channels, especially if the water dips into the upper 50s. Snook migrate up into rivers, creeks, and canals in the winter. Anglers fishing Siesta Key target them using both live bait and artificial lures. A large live shrimp is the best live bait. Deeper holes, docks, and other structure are good spots to try. Artificial lures such as plugs allow anglers to cover a lot more water in a short amount of time. Spring is a great time to be fishing in Florida! Just about every species is available at one time or another. Sheepshea will still be present in the passes. Action on the flats will heat up with speckled trout, Spanish mackerel, and other species. Snook and jack crevelle will have migrated out of the creeks and canals and onto the backcountry flats. Spanish mackerel, king mackerel, and false albacore should be out on the Siesta Key beaches. Both passes offer excellent fishing in the spring. Structure on the north end of Siesta Key will hold sheepshead, grouper, and snapper for anglers bottom fishing with live shrimp. Drifting the middle of the pass while bouncing a small jig on the bottom will produce pompano, mackerel, bluefish, and loads of ladyfish. The deep grass flats throughout the area, live in spring. Just about every species that can be caught on the deep grass flats will be in the spring. Speckled trout are normally the most abundant species, being caught on just about every grass flat between 5 feet deep and 10 feet deep. Spanish mackerel, bluefish, Pompano, ladyfish, snapper, grouper, cobia, sharks, flounder, jacks, and more may also be taken. As the shallow flats warm-up, snook, redfish, and jacks will be caught along mangrove shorelines and oyster bars. This is a great time to cast shallow diving plugs along these edges. Weedless spoons and jigs will also be productive. This type of fishing does not produce in terms of numbers, but anglers will generally catch larger fish. Action out on the beaches should be excellent as well. Spanish mackerel and king mackerel along with false albacore will be anywhere from right on the beach to several miles out. They will be foraging on the abundant bait fish. Sharks, cobia, and even and early tarpon may be hooked as well. Fishing is usually excellent in the summer time. Action on the deep grass flats is usually outstanding. The key to this fishing is the abundance of live bait fish that are present on the flats in the summer time. It is usually very easy to load up the live well with live bait then use them to chum the fish into a frenzy. Speckled trout, mackerel, ladyfish, grouper, snapper, sharks, bluefish, cobia and other species will be taken. It is hot in the summer however. The best bite is the early-morning one. Anglers get out there at first light, catch their bait, get their fishing in, and are home by 11 o’clock. With the abundance of bait fish, game fish are less apt to take and artificial lure. However, one strategy that does work well is to cast artificial lures first thing in the morning for an hour or so. Then, when that bite dies, switching over to live bait and chumming will get them going again. Snook fishing is good in the summer time as well. They are schooled up in the passes in are out on the beaches. Snook spawn in the summer and that’s what they are doing out in the Gulf of Mexico. Anglers site fish for snook as a cruise just a few feet off of the beaches. Small white plugs and jigs work well as does live bait. Fly anglers score using white bait fish patterns. Snook are stacked up in the passes in the summer time. 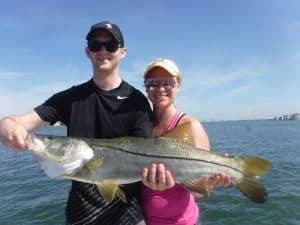 Anglers fishing Siesta Key and targeting snook do well using live bait around the deeper structure in the passes. Rocks at the northwest tip of Siesta Key are an especially productive spot. Live pilchards can be used to chum the snook up. They will also take a nice live shrimp. Anglers can also beat the heat of the day by fishing at night. Lighted bridges and docks throughout the area attract shrimp and small minnows. This in turn attracts game fish such as speckled trout, snook, jacks, and other species. Live bait works well as does any artificial lure or fly that mimics the shrimp and small bait fish. Tarpon show up off the Siesta Key beaches in mid May. Many anglers consider tarpon the ultimate fishing challenge. These fish average 75 pounds and grow well over 150 pounds. Anglers cast to schools of fish using live crabs, live bait fish and even fly fisherman get in on the bite. This is as much hunting as fishing, and is best for more experienced anglers. It takes time in patients, but when it all comes together the result is the fish of a lifetime! Anglers fishing Siesta Key in the fall have a lot of room to themselves. With the kids back in school and many outdoorsmen hunting, fishing pressure is light. By mid October the tropical storms are done, the water is cooling off, and the bite is on. Snook are moving out of the passes and into the backcountry. Action on the deep grass flats picks up as the water cools off. False albacore and Spanish mackerel should be options in the inshore Gulf of Mexico. As the water cools into the mid 60s, the bait fish that were abundant in summer time leave. This results in jigs and other artificial lures once again been very productive on the deep grass flats. The cooler water temperature also makes the fish more active and aggressive. 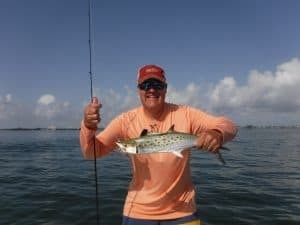 Speckled trout, pompano, Spanish mackerel, ladyfish and other species should be plentiful on flats between 6 feet of water and 10 feet of water. Live shrimp will certainly produce plenty of fish as well. Snook will be found in the same spots as they were and spring. Mangrove shorelines and oyster bars in the back water areas of Roberts Bay in North Sarasota Bay will be productive. Live bait fish will be caught most years until early November. Anglers can use them to chum snook and jacks up in the same spots. Action and the inshore Gulf of Mexico can be nothing short of spectacular in the fall when conditions are right! The weather in the fall as more stable than it is in the spring, with fewer fronts. High-pressure system seem to stall right off of the Florida Georgia line 4 days at a time. This results in East and Northeast winds which keeps the Gulf of Mexico clear and calm. Spanish mackerel and false albacore are most often targeted as they forage on bait fish. Kings, cobia, and sharks are available as well. It was nearing dusk as I eased my Jon boat around a sharp bend in the river. A dead oak tree was lying in the water; a very likely fish-holding spot. Erinn cast out her plug, twitched it twice, and a huge boil appeared where the lure used to be. The drag screamed as the snook headed back to the sanctuary of the fallen timber. I put the electric trolling motor on high and tried to drag the fish into open water. Fortunately, we had a little room to maneuver. Erinn played the fish like a pro, patiently letting it make several short runs before I slid the net under it and held it up for a quick photo before releasing it back to please another angler in the future. Another successful Sarasota river snook fishing charter! We are blessed in Siesta Key, Sarasota, Florida with a wide variety of angling options, but river fishing for snook is my personal favorite. The solitude, scenery, and wildlife are worth the trip alone, and the chance to land trophy fish casting artificial lures on fairly light tackle is just icing on the cake. Best of all, this method is pretty simple and straight-forward for anglers willing to put in a little time and effort. The Manatee River, Braden River, and Myakka River are the top spots.These are all a short drive from the Siesta Key beaches. 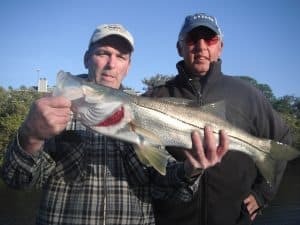 Snook are the premier inshore game fish in Florida. They are a subtropical species and cannot tolerate water temperature cooler than 60° for very long. They are found roughly from Orlando south on both coasts. 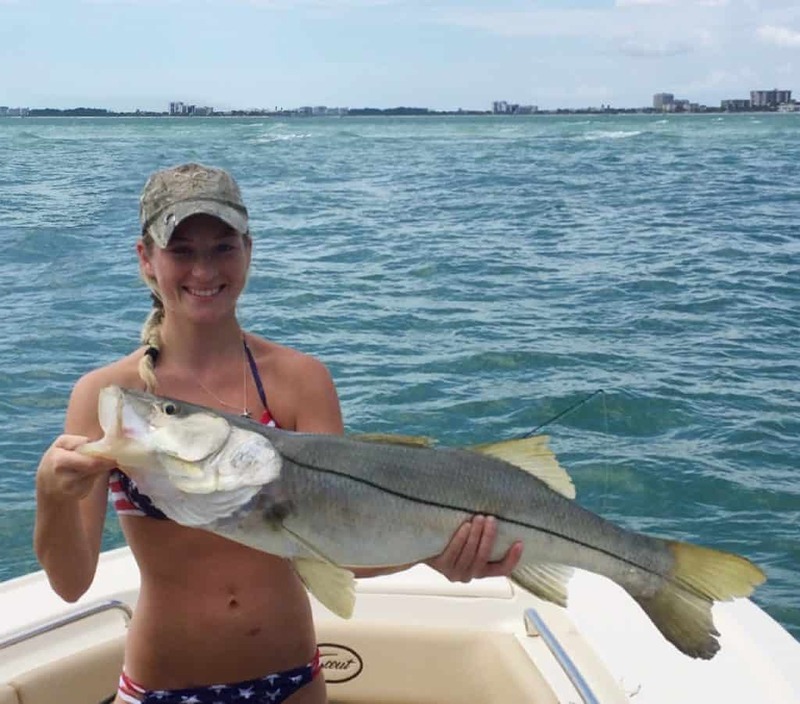 Snook grow quite large, with the state record approaching 50 pounds. Snook are very similar inhabits to freshwater largemouth bass. They can be caught all year long, and creeks and rivers in the winter, the flats in the spring and fall, and out on the beaches and in the passes in the summer. They can be caught using live bait but will readily hit artificial lures and flies. 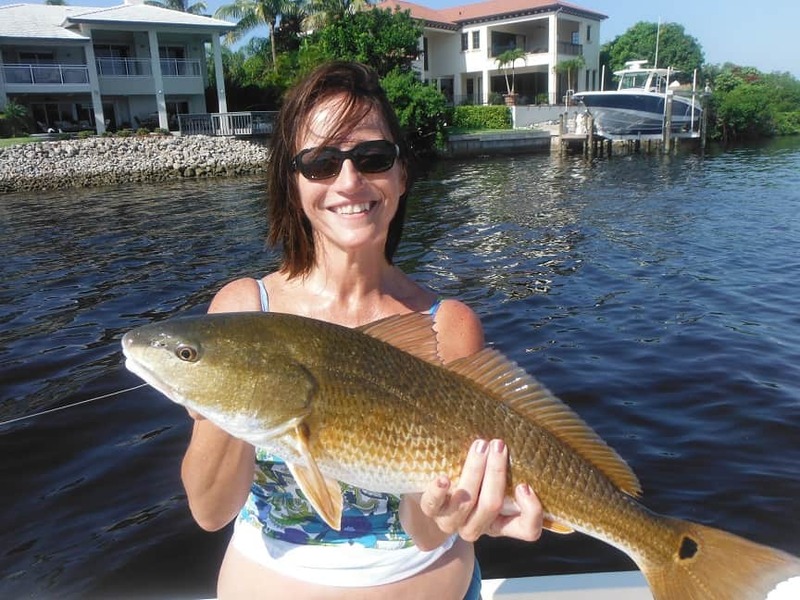 Redfish are perhaps the most challenging species for anglers fishing Siesta Key. There a highly sought after fish all along the Gulf Coast. They are caught all year long using two primary techniques. Redfish are caught on the shallow grass flats by anglers casting weedless spoons and soft plastic baits. Late Summer is the best time to find the large schools of redfish. Many reds are caught by accident by anglers fishing docks with live shrimp. Like most game fish, reds like the shade and structure that docks provide. A nice lively live shrimp free lined up under the dock is hard for them to resist. Anglers use live pin fish as well. Spotted sea trout, better known locally as speckled trout are arguably the most popular inshore game fish throughout the south. While redfish are popular, trout are plentiful, cooperative, beautiful, and fantastic eating. Trout are fairly aggressive and are found in large schools. When trout are located, the action is usually fast. Most speckled trout in the Siesta Key and Sarasota area are found on the deep grass flats. This is especially true for the numbers of school trout. Larger gator trout are found often times alone in the shallower water in potholes and along oyster bars. Trout are taken on a wide variety of artificial and natural baits. Tarpon earned the nickname the Silver King. It is a unique opportunity for an angler to be able to cite cast using spinning tackle to fish of over 100 pounds that are rolling 30 feet away. This is not easy fishing and requires patience and time on the water. There will be days when no fish are hooked. However, anglers fortunate enough to hook and land a tarpon will never forget it. The best time of year to catch Siesta Key tarpon is from mid-May to late July. Spanish mackerel are a terrific, and sometimes underrated game fish. Mackerel are very fast and when hooked make a long blistering run. They are very aggressive and will hit just about any artificial lure, bait, or fly when well presented. Mackerel school up in very large numbers at times off of the Siesta Key in Sarasota beaches. They are also found on the deeper flats inside Sarasota Bay, particularly just inside the passes. Spanish mackerel are terrific eating when enjoyed that evening. Pompano are one of the finest eating fish that swims. Even local anglers get excited when the pompano start to run. Though they average 2 to 3 pounds, they put up a fight that many anglers would credit fish three times their size. They are smaller versions of a permit. They are most often caught using shrimp and small jigs in the passes, on the deep grass flats, and out on the beaches. Fall is the best time to catch them, with spring being a close second. 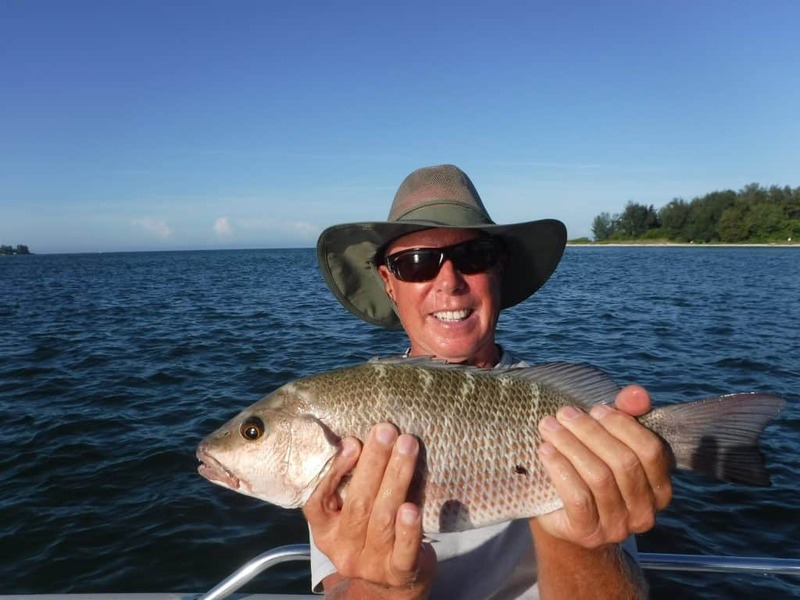 Mangrove snapper are a very desirable species for anglers fishing Siesta Key. These saltwater pan fish are aggressive and put up a nice little battle on light tackle. However, the reason they are so prized is for their value on the dinner plats. Mangrove snapper are fantastic eating! Snapper are structure oriented fish. They are found in the rocks and seawalls on the north end of Siesta Key in Big Pass. They are also found under docks and bridges throughout the area. Oyster bars and holes in creeks will hold them as well. Snapper also school up on the deep flats in July and August. Bluefish are well-known to northern anglers. However, anglers fishing Siesta Key catch them all year long, with the cooler months producing more fish. Blues are very aggressive and are usually found in schools. Once located, the bite can be fast and furious! Most bluefish are caught on lures by anglers drifting the deep grass flats. They are found in the passes as well. Smaller bluefish are decent eating when iced immediately and eaten right away. Jack crevelle, or “jacks” for short, are one of the hardest-fighting game fish in salt water. They are a bit like over-sized bluegill. They have broad sides and pull very hard. Jacks school up in large numbers and feed aggressively as competition kicks in. They are often seen feeding on the surface. Lures work very well, but jacks can be caught on live bait as well. Jacks can be found anywhere, but larger ones are taken in creeks, canals, and rivers in the winter. False albacore are a terrific game fish! They are basically small tune fish. They are very fast and will empty the spool in short order. Anglers fishing Siesta Key target them off of the beaches. Point of Rocks is a top spot. Most anglers sight cast to breaking fish as they forage on the surface. Plugs,, jigs, spoons, and flies that mimic bait fish will fool them. Sheepshead are a staple of Siesta Key anglers in the winter. They have saved the day on many a Siesta Key fishing charter. They school up near structure such as docks and submerged rocks. Sheepshead pull hard, grow to 5 pounds regularly, bite when cold dirty water shuts down other species. And, they taste great! Sheepshead are seldom caught using lures. Live or dead shrimp is the top bait. Gag grouper are mostly caught by anglers fishing offshore. They are highly prized and are caught bottom fishing with live and frozen bait. Grouper are very structure oriented and are normally found near docks, bridges, and other structure. They are caught inshore as well. In the late summer, small gag grouper are caught on the open flats as they migrate out to the Gulf of Mexico to mature. They are fantastic eating! 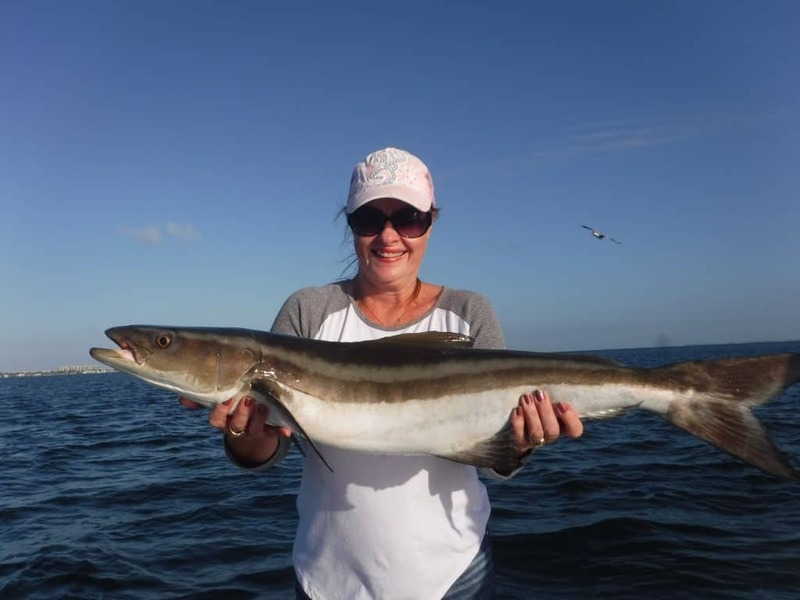 Cobia are another species that are caught primarily in the Gulf of Mexico. They are found over the inshore artificial reefs off of Lido Key. However, they do wander into Sarasota Bay and Roberts Bay. They are caught occasionally by anglers targeting other species. Cobia will hit lures and love a live pinfish. 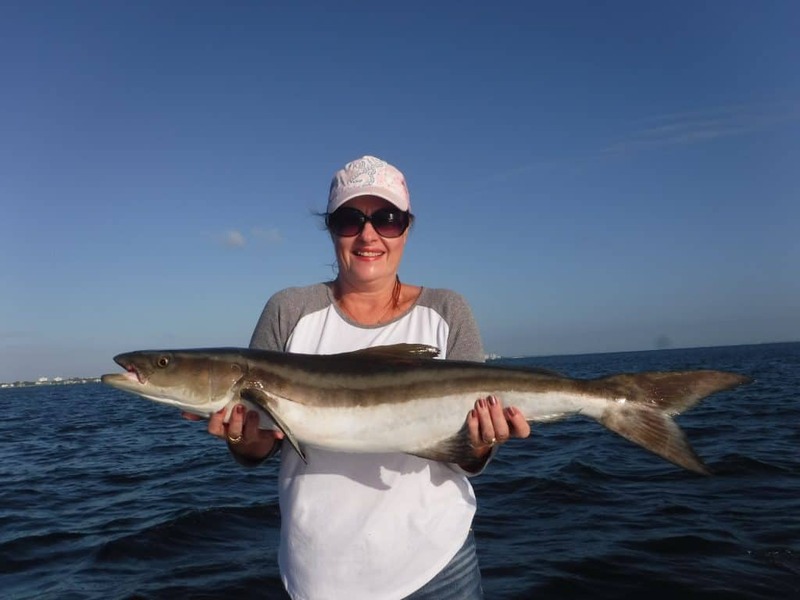 They are great eating, but most cobia caught inshore are a bit short of the legal minimum limit of 33”. Black drum are often mistaken for sheepshead. They look similar, sporting black vertical bars. However, they are a bit more tapered and have barbels on their chin. Black drum are caught in the same spots as sheepshead, particularly under and around docks. They are rarely caught on lures, with shrimp and crab being the top baits. Smaller drum are very good to eat, larger fish can be wormy. 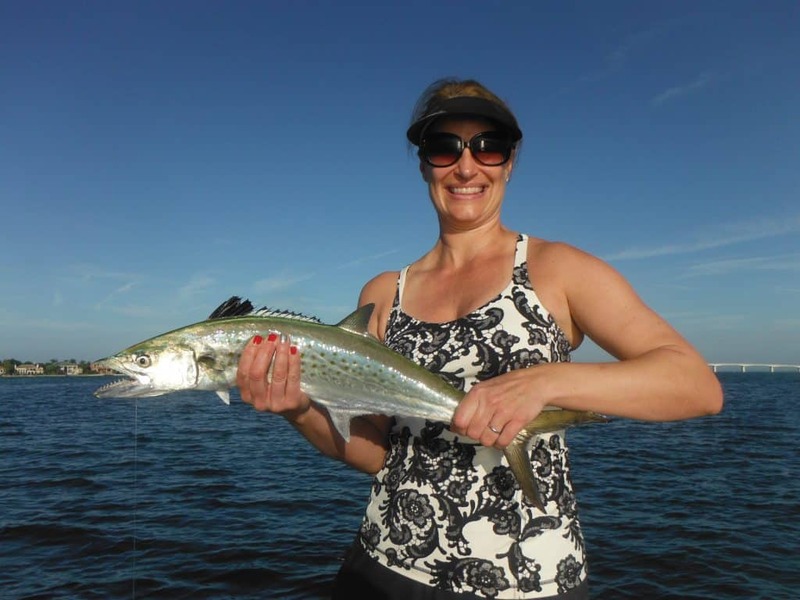 Ladyfish are great sport on light tackle! Some anglers disparage them since they are not good to eat. Ladyfish are aggressive and will take artificial lures and flies. Many are caught on live bait as well. They are a great fish to teach young and inexperienced anglers how to use lures and fight a fish that makes runs and jumps. 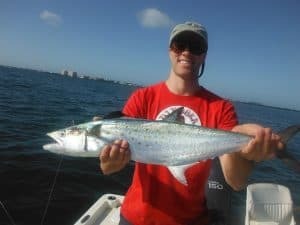 Ladyfish have saved many Siesta Key fishing charters! Angler fishing Siesta Key can find all Florida fishing regulations at the FWC site. This page will list my Sarasota fishing videos. Sarasota offers visiting anglers many different species to catch in several different techniques with which to catch them. These videos will give you an idea of what our fishing is all about. Sarasota is a resort city on the West Coast of Florida. It lies about an hour south of Tampa. It is famous for its world class beaches, shopping, and restaurants. However, Sarasota also offers visitors some excellent fishing opportunities. Anglers can target speckled trout, Spanish mackerel, bluefish, Pompano, and other species on the deep grass flats. Snook and redfish are caught by more experienced anglers along mangrove shorelines. The inshore Gulf of Mexico can have fantastic action on pelagic species and the spring and the fall. Giant tarpon provide the ultimate angling challenge! My list of Sarasota fishing videos will give perspective clients an idea of what they can expect on their visit. There are so many different species to catch here, and multiple ways to catch them. 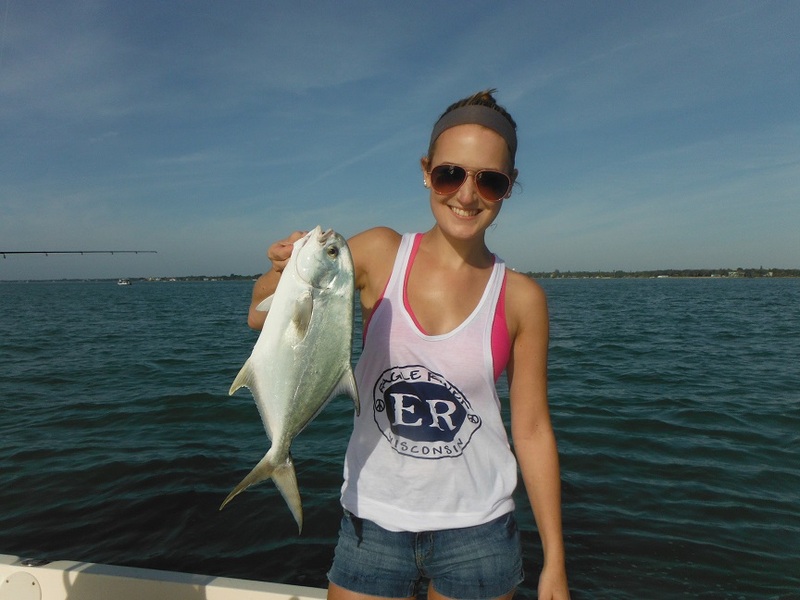 Sarasota fishing charters are tailored to the skill level and expectation of the clients. Please enjoy these Sarasota fishing videos! Sarasota family fishing charters is a video that shows that anglers do not need a lot of experience to catch fish. 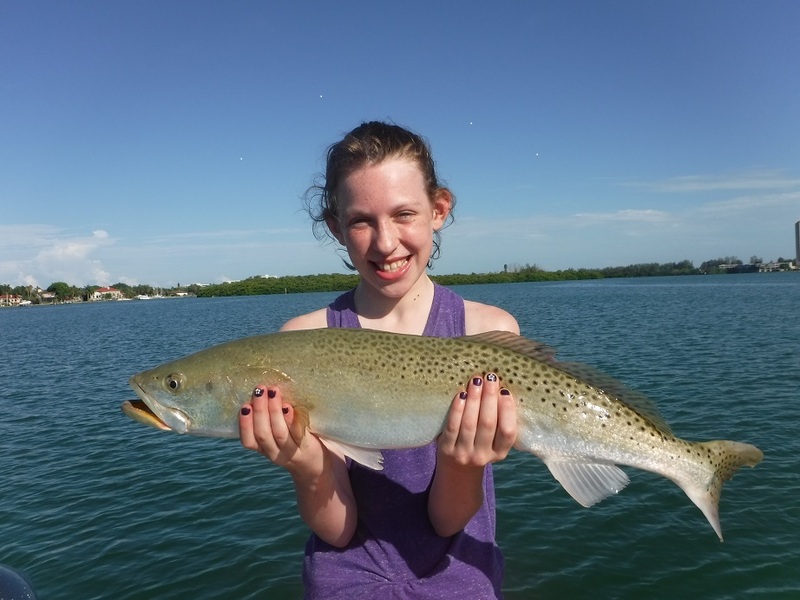 Young anglers are most welcome on Sarasota fishing charters! Capt. Jim enjoys taking children and other novice anglers out for a day of fun. Live bait is often used on these charters as it increases the chances of success. 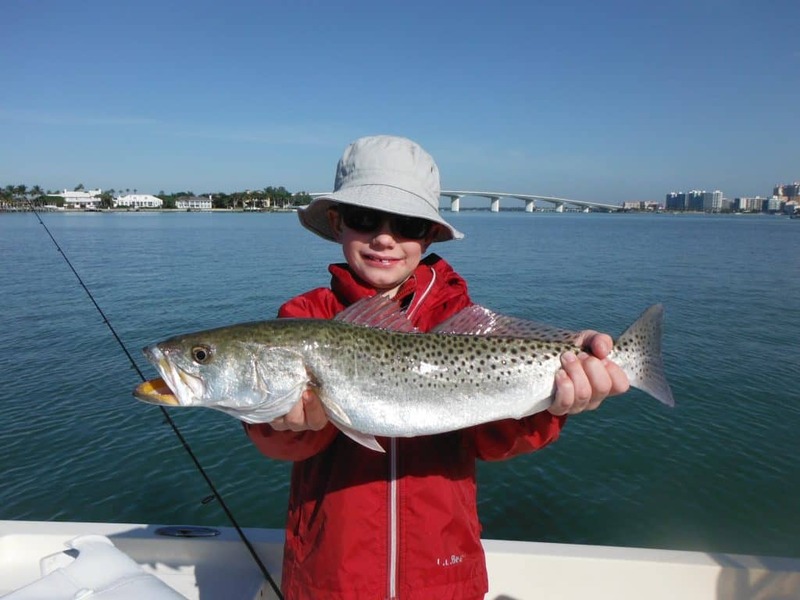 When taking children and inexperienced anglers out on a Sarasota fishing charter, Capt. Jim generally targets the deep grass flats. Many different species are caught over submerge grass beds in water between 5 feet deep and 10 feet deep. Speckled trout, Spanish mackerel, pompano, ladyfish, bluefish, and more are taken in the spots. Anglers fishing docks catch bottom fish such as snapper along with snook, redfish, and other species. 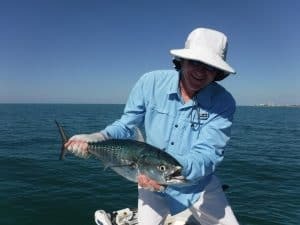 Sarasota Spanish mackerel fishing shows how incredible the action in the inshore Gulf of Mexico can be when conditions are right. Spanish mackerel, king mackerel, false albacore, cobia, and sharks migrate up and down the coast in the spring and the fall. They are following the huge schools of bait fish that they feed on. This is very exciting fishing is so much of it is visual. Quite often, large schools of macro and false albacore are seen feeding ferociously on the surface. They have herded up the glass minnows and other bait fish and have them trapped against the surface of the water. Just about any lure, bait, or fly that remotely resembles the forage they are feeding on will get devoured. Sharks will hover around the edge of the feeding fish, picking up the scraps. Siesta Key snook fishing is a video that shows how fast the action can be when snook are schooled up in one spot. Chumming with live bait is a deadly technique that Capt. Jim uses in the warmer months. Live bait fish are caught and used both as chum and as bait to catch the fish. Handfuls of live, unhooked fish attract the snook and get them in a feeding frenzy. This technique is extremely effective. It also allows anglers who are not very experienced to have the chance to catch a really nice fish. Since the game fish are excited, they lose a bit of their caution. Along with the snook, redfish, jacks, large trout, and other species will be caught while targeting snook. 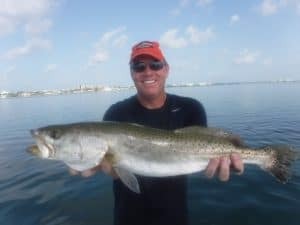 Best Sarasota fishing charter is a video that shows visiting anglers some great action out in the inshore Gulf of Mexico. Spanish mackerel were thick just off the beaches that day. These two boys had a great time catch and those along with some small sharks. This type of action is not uncommon in the fall, especially the few weeks coming up on Thanksgiving. 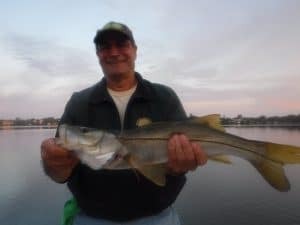 River snook fishing is a video that shows Capt. 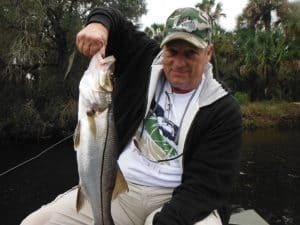 Jim catching a nice snook in the Myakka River. In the cooler months, these apex predator game fish move up into area creeks, rivers, and residential canals. They do this to escape the extreme weather changes that can happen on the shallow flats. Water can drop as much is 10° in a couple days on the exposed open flats. The water temperature and rivers and canals is significantly warmer. This Sarasota fishing charter has a freshwater feel to it. Anglers drift with the current down the river and a 14 foot Alumacraft Jon boat. They cast artificial lures towards likely looking shoreline cover and structure. Most often, shallow diving plugs are used, but soft plastic baits catch plenty of fish as well. This is a trip best suited to more experienced anglers as it is more about a couple quality fish versus numbers of fish. 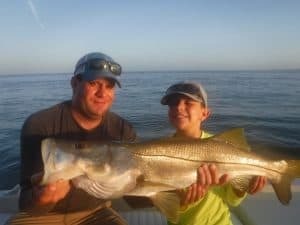 Siesta Key fishing charters is a video that shows some great action on snook and jack crevelle by anglers using live bait in the fall. These fish are most active in the spring and again in the fall. The east side of Siesta Key in both Roberts Bay and little Sarasota Bay has some great fish holding structure. Oyster bars, docks, creeks, and flats will all produce great catches at one time of the year or another. 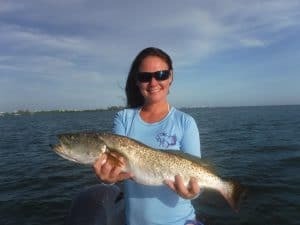 Sarasota speckled trout fishing shows a couple of anglers as a cast lures and live bait while drifting the deep grass flats. This is a technique that produces a lot of fish for Capt. 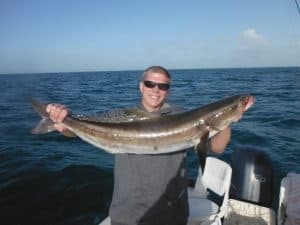 Jim on Sarasota fishing charters throughout the year. It is also easy for anglers to learn to do quickly. Most speckled trout in Sarasota are caught over the deep grass flats. These are large areas of submerged grass or vegetation and water between 5 feet deep and 10 feet deep. Bait fish and crustaceans such as shrimp and crabs find refuge in the grass. This in turn attracts speckled trout and other game fish. Sarasota summer fishing charters is a short little video that shows what happens when you come across schools of “breaking” fish. These are fish that have rounded up a bunch of bait fish and push them to the surface. They are helpless as a are trapped against the top of the water. 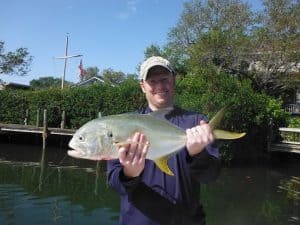 Ladyfish, jacks, mackerel, bluefish, and other species will be seen doing this throughout the year, but especially in the late summer when bait is plentiful. Sarasota freshwater fishing is a video that shows visitors that there are freshwater fishing opportunities in this area. Saltwater fishing gets the vast majority of the coverage and attention in Sarasota. Therefore, the freshwater fishing gets overlooked. Several small lakes along with rivers offer anglers the chance to catch bass, crappie, catfish, bluegill, and other species. The top lakes in the Sarasota area for freshwater fishing are upper Myakka Lake, Lake Manatee, Benderson Lake, and Lake Evers. Each Lake is a bit different and has its good and bad points. Some have horsepower and access limitations. Rivers flowing in and out of the lakes also offer good fishing for freshwater species as well as title species in the river downstream from the dam. Sarasota false albacore fishing shows my buddy Tommy Hyser as we work a school of false albacore on the surface. This is a time. Just before Christmas. We are fishing over the submerged artificial reefs that are a couple miles off of Lido Key. These are great spots to find false albacore and other pelagic species such as Spanish mackerel and king mackerel. False albacore can be found anywhere on the beach foraging on the surface. Sarasota chumming techniques is a video that goes into detail on the tactic of live bait chumming. This is an extremely effective technique when bait fish are plentiful and easy to catch. Using a cast net, Capt. Jim loads up the live well with frisky live baits that are around 2 inches long. He then anchors on a good spot and begins to throw handfuls of the bait fish out behind the boat. If snook and other game fish are around, it won’t take them long to start feeding on the bait fish. Once the fish are excited and into a feeding mood, hooked baits are tossed back to mixed in with the chum. This is a great opportunity for anglers without a lot of experience to catch a nice snook, redfish, jack, or other species. Sarasota tarpon fishing gives anglers a look at what it is like to hook and land a giant tarpon. The video is only a few minutes long, it does not show the hours of patience that it often takes to hook and land one of these behemoths. For the most part, this is a site fishing situation. Anglers sit on the beach a couple hundred yards of shore and look for schools of fish to cast to. This is definitely a Sarasota fishing charter best suited for experienced anglers. Sarasota snook fishing shows a couple of experienced anglers casting artificial lures at first light. Rapala plugs and soft plastic baits on a jig head are cast around docs and the mouse of creeks. Snook were feeding on the outgoing tide, which is the preferred time to fish. This type of fishing is great fun and something that experienced bass anglers would certainly enjoy. 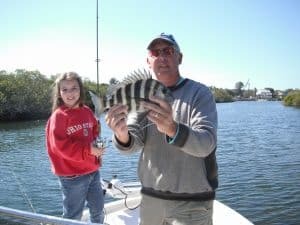 Sarasota sheepshead fishing shows anglers what it is like to target and catch these tasty saltwater pan fish. Sheepshead are members of the Porgy family. They feed around structure and mostly on crustaceans such as shrimp and crabs. Very seldom are they caught by anglers using artificial lures. A fresh shrimp fished around pilings such as in this video, along with bridges, rocks, seawalls, and other structure will produce sheepshead from December through April. Sarasota snook and jack with Erin is a video showing how a relatively inexperienced angler with rudimentary skills can have a good day of fishing. The key to this is the live bait that we use as both bait and chum. It evens the playing field quite a bit, and gives anglers a great chance to have success. Plug fishing Sarasota is a video about Capt. Jim and a buddy taking a day off of work to cast plugs on the Myakka River. This is a very relaxing and enjoyable fishing trip. Shallow diving plugs cast towards submerged trees and other structure will produce snook, largemouth bass, jacks, and other species. This type of Sarasota fishing charter is best for anglers with a fair amount of experience. Sarasota crappie fishing is another video highlighting the excellent freshwater fishing opportunities available to anglers in Sarasota. Crappie have become a very popular fish throughout the United States. The same techniques that produce fish all over work well in Sarasota, too. Trolling with brightly colored jigs and fishing with live minnows produces best. 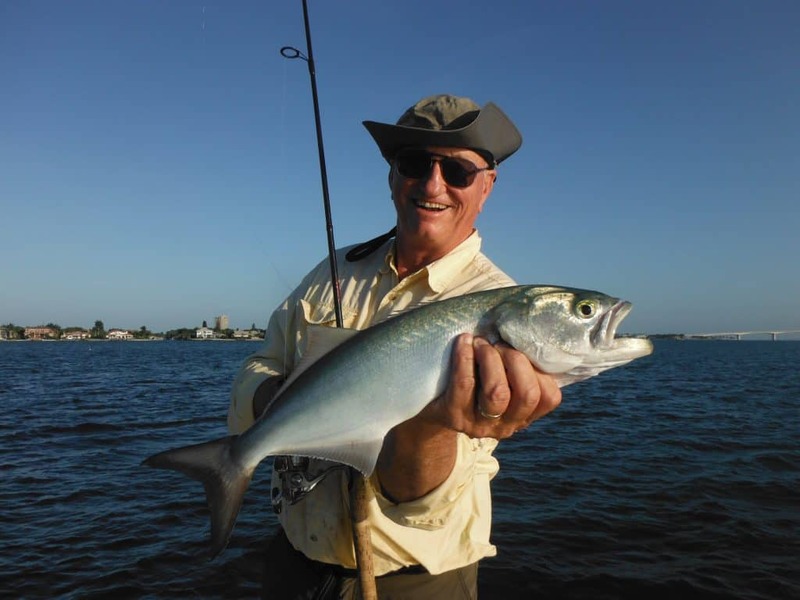 Sarasota jack crevelle shows how easy and exciting it is to catch a nice Jack on a fly rod and area rivers. Just like to snook, jacks migrate up into these rivers in the cooler months. They can often be seen foraging on the surface as in this video. Jacks are very aggressive and in a mood to feed in this situation. They will hit just about any lore or fly with reckless abandon. This is great fun is so much of the action is visual. Mixed bag on the Myakka is a video showing how many different species can be caught by anglers simply fishing a worm on the bottom. This is a technique that is been used for centuries and is still effective to this day. It is an easy and relaxing way to fish and produces both action and variety on the Myakka River and everywhere. Sarasota River fishing gives perspective clients an idea of what to expect on a River snook fishing charter. Anglers cast plugs and other lures towards the shoreline is a meander down the stream in a small boat. 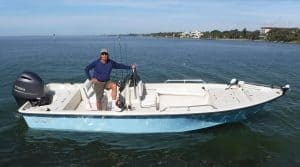 This is a very relaxing Sarasota fishing charter with great scenery in the chance to catch a really large fish. Sarasota bass fishing is a video that shows Capt. Jim and Capt. Jack taking a day off work to catch a few bass on Upper Myakka Lake. The to cast artificial lures such as spinner baits, plugs, and soft plastics to catch a few chunky bass on light tackle. 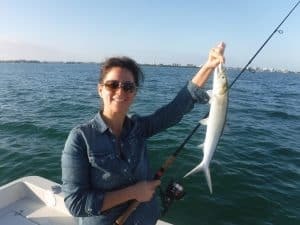 Longboat Key fishing charters is a video to show visitors to Longboat Key the angling options that are available to them. This video focuses on family fishing with children and less experienced clients. Capt. Jim will tailor the trip around the clients skill level and expectations to give them the best chance of success. Live bait is generally the most productive method. In closing, I hope this post showing Sarasota fishing videos gets you excited to go on a Sarasota fishing charter! Visiting anglers from all over the world will enjoy a Sarasota fishing excursion. Sarasota is a small resort town on the West Coast of Florida. It lies about an hour south of Tampa. Sarasota offers a variety of fishing opportunities and many different species that can be caught. Capt. Jim Klopfer has been a fishing guide in Sarasota, Florida since 1991. He is very well-rounded and can accommodate anglers of all skill levels and ages. Novice clients are welcome as is the seasoned angler seeking more of a challenge. Capt. 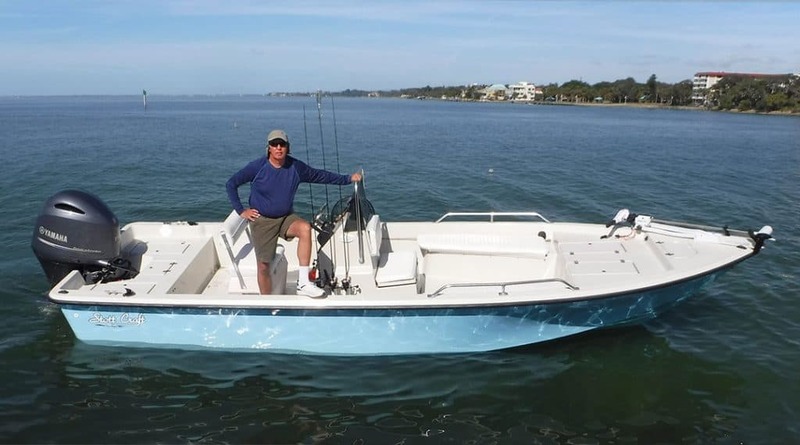 Jim runs his Sarasota fishing charters out of a 22” Stott Craft bay boat. It is roomy and stable. Capt. 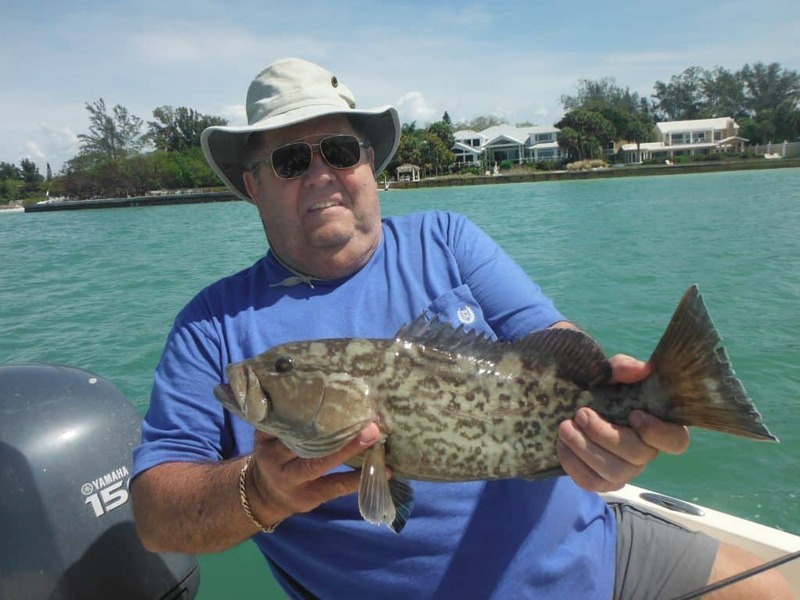 Jim is a great choice for anyone looking for a Sarasota fishing excursion. Anglers have several options when going out on a Sarasota fishing excursion. The inshore waters of Sarasota Bay offer plenty of action and variety. On most fishing charters, six or so different species are landed. However, it is not uncommon to land double digits on a four hour fishing charter. The waters of the Gulf of Mexico close to shore provide very good action as well. In the spring and fall Spanish mackerel, false albacore, king mackerel, sharks, and other species migrate along the Sarasota beaches. 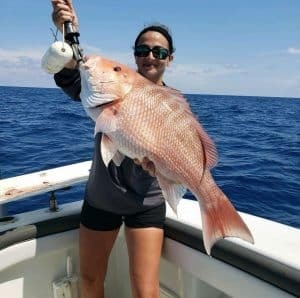 Several artificial reefs a couple miles offshore offer good fishing for bottom fish such as sheepshead, grouper, and snapper. Natural ledges and artificial reefs provide good fishing for anglers heading offshore. The area from about 8 miles out to 30 miles out has plenty of good bottom spots to hold grouper, snapper, amberjack and other species. King mackerel, false albacore, cobia and other pelagic species will be taken as well. And inshore bay trip is the best Sarasota fishing excursion for most clients. This is especially true for novice anglers or families with children. Most trips are four hours long, though trips can certainly be longer. But, four hours is plenty of time to catch a bunch of fish. Mornings are usually the most productive, however in the colder months the afternoons can be better as the water warms up. Anglers fishing the inshore waters can drift the grass flats for a variety of species. 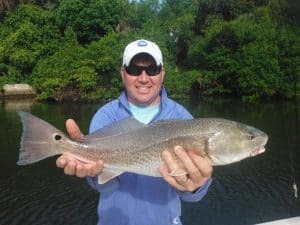 Speckled trout, Spanish mackerel, Pompano, bluefish, jacks, snapper, grouper, sharks, ladyfish, catfish, flounder, and other species are often taken on the deep grass flats. These are basically areas of submerged grass and weed beds. This vegetation attracts the shrimp and bait fish, which in turns attracts the game fish. Artificial lures are used quite often when drifting the grass flats. The number one lore by far is a jig and grub. This is a hook with a little bit of weight in the front and a plastic body. It mimics a shrimp or bait fish. They cast a long way and are easy to learn to use. Jigs often out fish live bait on a Sarasota fishing excursion. Live bait is used quite often on inshore bay trips when drifting the deep grass flats. 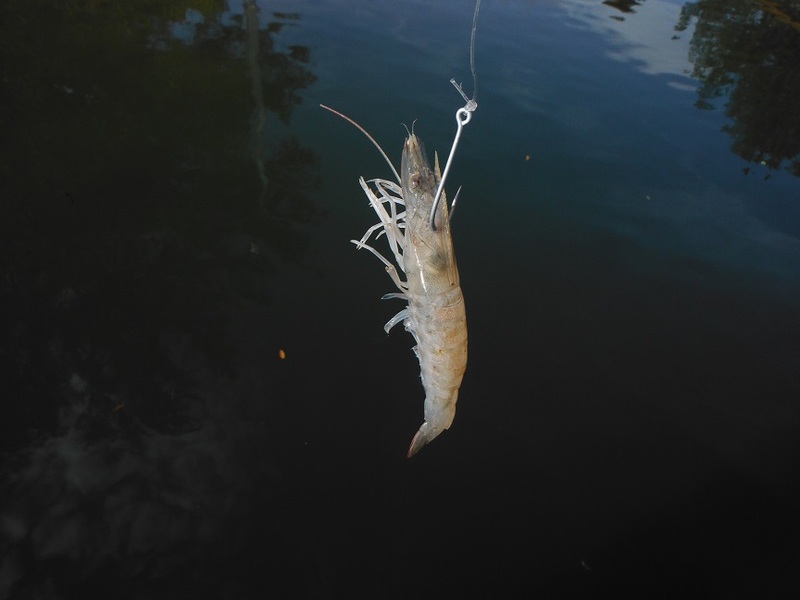 The number one bait in all of Florida, Sarasota is no exception, is a live shrimp. Shrimp are available all year long at local bait shops. Everything that swims will eat a nice lively shrimp. I like to joke that they are the “nightcrawler of saltwater”! Small bait fish are used on the deep grass flats as well. This is especially true in the summer time. Bait fish are usually thick on the shallow flats near the passes in the summer. Capt. Jim will catch a bunch of them in his cast net. He will then use the live bait as both chum to attract fish to the boat and as bait to catch the fish. This is an extremely effective technique in the summer and produces a lot of fish. Sarasota has two passes that connect the Gulf of Mexico with Sarasota Bay. They are called Big Sarasota Pass and New Pass. Passes are basically inlets. Both offer excellent fishing most of the year. The passes can provide excellent action on a Sarasota fishing excursion. Pompano, ladyfish, bluefish, jacks, and Spanish mackerel are caught drifting the passes. As the tide moves the boat along, anglers cast out lures or drift with live bait to catch the species. Ladyfish in particular will oftentimes school up thick in the passes. They are great fun on light tackle and are a good species for novice anglers to practice on. Structure in the passes provide excellent habitat for bottom fish. Sheepshead spawn there from January through March and are usually available and good numbers. This is another situation that is great for novice anglers. A live or frozen shrimp is hooked on and simply drop to the bottom, he required. Grouper, snapper, drum, and other species will be taken as well all year long. More experienced anglers may seek the challenge of trying to catch snook, redfish, and jack crevelle. These fish are larger and more difficult to catch. Shallow flats, mangrove shorelines, docks, bridges, oyster bars, and creeks are all spots that are targeted on a Sarasota fishing excursion when targeting these species. Once again, both artificial lures and live bait can be employed to achieve success. Lures are a great choice when fish are scattered about. They allow anglers to cover a lot of water in a relatively short amount of time. Often times these flats and mangrove shorelines are fairly large areas. Lures are more practical while searching for fish in the spots. Top water plugs, shallow diving plugs, weedless spoons, and jigs with soft plastic trailers are the top baits. A large live shrimp is a great bait to catch a snook or redfish under a dock. These big shrimp are not always available. However, when they are, they are terrific baits. They also work well in the cooler months fished around oyster bars, creeks, mangrove shorelines, and any other structure. Live bait fish are used in the warmer months much the same as on the deep grass flats. Once a well full of bait is acquired, the boat is anchored in a likely spot. Live bait fish are then tossed out to attract the snook and other game fish. Once they are behind the boat and excited, they are usually pretty easy to catch. This is a great technique to use to give a novice angler the chance to catch a nice fish. The inshore waters of the Gulf of Mexico off of Lido Key and Siesta Key can provide great action at times. When the seas are calm in the water is clear, pelagic species such as Spanish mackerel, false albacore, king mackerel, cobia and more will migrate through the area. They are generally right on the heels of the huge schools of bait fish. One of the most exciting aspects of this type of fishing is that much of it is visual. Fish will often be seen foraging on the surface as a devour the helpless bait fish. Just about any lure, bait, or fly that remotely resembles the bait fish will draw strike. Spanish mackerel are usually fairly easy to catch in this situation, while false mackerel can be a bit fussier. This is great fun and a popular choice on a Sarasota fishing excursion when conditions are favorable. There are three inshore artificial reefs just off of Lido Key. They consist of old bridges, construction material, and other debris. Most of the bottom in the Gulf of Mexico is barren. Therefore, any structure will attract and hold fish. Both bottom fish and surface feeding pelagic species will be attracted to these reefs. Sheepshead are plentiful on the inshore artificial reefs in February, March, and April. They provide great action for clients on a Sarasota fishing excursion. Sheepshead pull hard, grow to 5 pounds, and are very good eating. They feed primarily on crustaceans. Therefore, live shrimp are a terrific bait for these members of the porgy family. Mangrove snapper are found on these reefs all year long. Snapper school up in big numbers and can be quite aggressive. The trick with the snapper is to find the larger specimens. Hordes of 8 inch snapper will devour every bait that’s drop-down. Moving around a bit can help to find the schools of larger fish. Also, a larger bait or a live bait fish may help. Gag grouper, flounder, grunts, and other bottom fish will be caught as well on a Sarasota fishing excursion. These reefs will also attract pelagic species such as Spanish mackerel, king mackerel, cobia, and false albacore. On days when the albacore and mackerel are not seen working on the surface, the artificial reefs can be a great backup plan. The structure on the reefs attract plenty of baitfish, which in turn will attract the game fish. Often times, the bait can be seen dimpling on the surface right over the reef. Anglers can also choose to target tarpon. Giant tarpon show up in early May and stay until late July. They average 75 pounds and grow to over 200 pounds! Many consider this to be the ultimate fishing challenge. Tarpon are sight fished just off of the Sarasota beaches. Once the fish are found, the boat is eased into casting range. Live crabs and bait fish are cast towards the fish in hopes of a take. When a tarpon eats, it is bedlam! Many anglers enjoy going offshore fishing off of Sarasota. In most instances, the goal is to put some meat in the cooler. Grouper are a highly sought after bottom species in the Gulf of Mexico. They are structure oriented and will be found over natural ledges as well as artificial reefs and wrecks. Grouper pull hard and once they feel the hook it will dive down into the cover. The trick for anglers is to get their head turned and get them coming up towards the boat. Live and cut bait is used when bottom fishing for grouper and other species. Along with the grouper, snapper, triggerfish, grunts, and other species will be taken. Amberjack will be caught on the deeper wrecks as well. Red grouper are found over the Swiss cheese bottom about 15 to 20 miles offshore. Anglers can find Florida saltwater fishing regulations on the FWC site. The primary species for anglers trolling offshore is king mackerel. Kings are taken year-round, but particularly in the spring and fall. Ledges and wrecks from about 7 miles offshore to 30 miles offshore are the prime area. Anglers troll spoons and plugs as well as live bait to catch the king fish. Anglers venturing further offshore may encounter a wahoo, tuna, or dolphin. Occasionally, sailfish and other bill fish are hooked. Experienced anglers visiting Sarasota and seeking a unique experience may opt for a river fishing charter. In the cooler months, snook and jacks migrate up into area rivers. They do this to escape the cooler temperatures on the shallow flats. The darker river water is often times significantly warmer than the exposed waters on the flats. This provides a sanctuary for the temperature sensitive game fish. This type of Sarasota fishing excursion is not about numbers. This trip is about the chance to catch a trophy snook. Artificial lures are most often used as they allow anglers to fish a lot of shoreline cover in a relatively short amount of time. Shallow diving plugs are generally used. They will elicit a reflex strike from the predatory snook. The overall experience of a river fishing charter is a bit different. Capt. Jim uses a 14 foot Alumacraft jon boat for this type of fishing. Launching ramps can be primitive and the water is often times shallow in the winter. This requires a boat that can be manhandled off the trailer and will float over a shallow sandbar. Jon boats our perfect for this type of fishing as they meet these requirements and are quite stable. The scenery in solitude are elements that attract anglers to this Sarasota fishing excursion. It is a very relaxing fishing trip. It won’t produce in terms of numbers or action like an inshore bay fishing charter will. However, persistent and patient anglers will have the opportunity to land the snook of a lifetime! Fly fisherman are not to be left out either. Many of the species caught on a Sarasota fishing excursion will take a well presented fly. 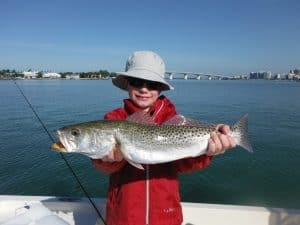 Speckled trout, Spanish mackerel, bluefish, pompano, snook, redfish, false albacore, jacks, ladyfish, and more can be taken in Sarasota throughout the year. The best all round outfit for fly anglers to use when fishing Sarasota is an 8wt or 9wt rod, matching reel, an intermediate sink tip line. A 9 foot tapered leader with a 30 pound bite tippet works well. Just about any bait fish or a crustacean imitation will catch fish. Top producing flies are the Clouser Minnow, D.T. Special, and Crystal Minnow. White is a great color as are combinations of white and chartreuse, and white and olive. In closing, anglers seeking a memorable experience will go out with Capt. 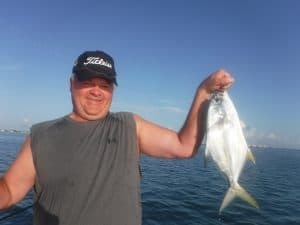 Jim on a Sarasota fishing excursion! In this article I am going to provide a Sarasota fishing calendar. This is basically a Sarasota fishing forecast. It is based on my more than 30 years experience fishing in Sarasota. While every year is different, throughout the years Sarasota seasonal fishing patterns hold up. Warm winters, stormy summers, when, red tide, and other factors affect fishing. However, in my 27 years of running Sarasota fishing charters, I see that the patterns replicate themselves. I will share those patterns in a month by month report. Fishing in January is all about the weather. There will be days when it’s 80° and sunny. There will be days when it’s cold, blustery, and windy. In order to be successful in January, anglers need to adapt to the prevailing conditions. Fronts will move through regularly, resulting in dirty water in the passes and on the nearby flats. If it has been a cold month, some species will have moved back into the deeper water of creeks and residential canals. Snook and jacks in particular will seek the warmer water in the upper ends of canals and creeks. Anglers casting lures such as plugs that cover a lot of water are effective. Trolling is also a good way to locate fish, especially jacks. Bottom fish such as sheepshead, snapper, drum, and other species will be found around docs and other structure. Deeper water and some of the canals as well as in the passes will hold these fish. Big Sarasota Pass has a ton of structure on the north end of Siesta Key and also has deep water. This will hold bottom species all month long. Strong cold fronts will bring wind which will dirty up the water in the passes. When this occurs, it is best to fish the protected areas where the water will be cleaner. Fishing the deep flats will be cyclical in January. Several days after a front moves through, the water on the flats will clear up and warm up. This should result in decent action for speckled trout, bluefish, ladyfish, and other species. Anglers casting lead head jig’s and live shrimp will do well. If the water temperature is low, below 60°, speckled trout will be found in deeper water. Channels and holes near the flats will attract them. February is usually a tale of two months. The early part of the month is winter, but by the end of the month we are seeing hints of spring. The sheepshead run is in full swing and fish are loaded up in the passes and out on the nearshore artificial reefs. I target them a lot for clients who want a couple fish to eat. The flats and passes can be productive as well. 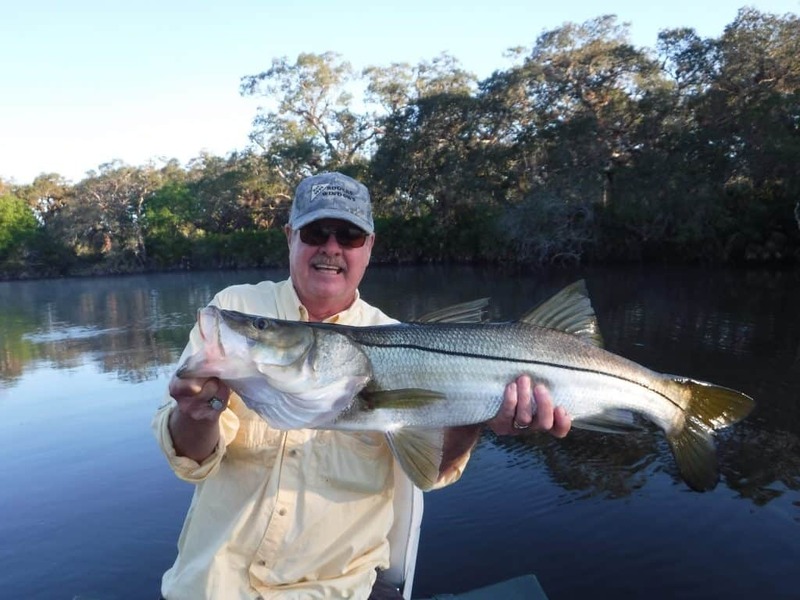 Snook and jacks will begin to migrate out of the creeks and canals as it warms up. The rocks in Big Pass hold a lot of sheepshead in February. This is pretty easy fishing. It is basic bottom fishing, where we drop a hook baited with a shrimp down to the bottom and wait for a bite. The great part about it is that anglers was very little experience can catch some nice fish. It is best to fish the pass during times of low or moderate current flow. It is difficult to anchor and control the baits when the tide is flowing hard. Docks throughout the entire area will hold sheepshead in February. Phillippi Creek in the residential canals will still be productive for jacks and snook. Rapala plugs and soft plastic baits work well. As it begins to warm up, the fish will migrate and will be found closer to the mouths of the creeks and canals. Action on the deep grass flats will start to be more reliable by the end of February. As fronts become less common and less severe, water clarity will stabilize and the temperature will rise. Submerge grass beds in 6 feet of water to 10 feet of water will hold many species. Speckled trout, Pompano, bluefish, jacks, Spanish mackerel, ladyfish and more will be taken on lures and live bait. 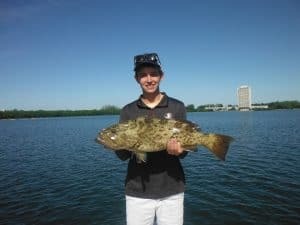 March can be a great month to be fishing in Sarasota! It is springtime, and as is true in most fishing, fishing can be very good. Rising water temperatures will have fish moving out of their winter hunts and scattering out onto the flats and in the passes. Migratory fish such as Spanish mackerel and false albacore will show up as well. The occasional front will still move through, and anglers will experience some windy days. But, the really cold morning should be gone. Action and the passes should be very good in March. Sheepshead should still be plentiful, though winding down by the end of the month. 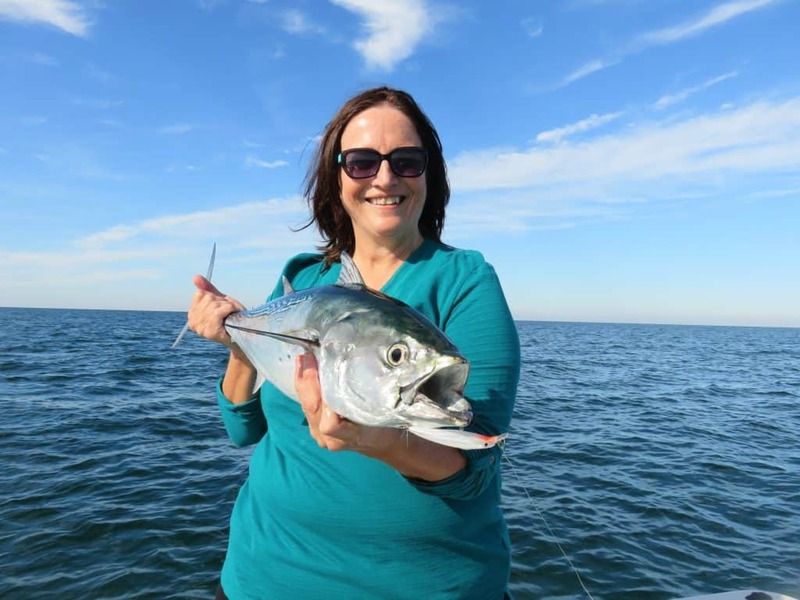 Anglers drifting the passes with jigs will catch ladyfish, Pompano, bluefish, jacks, and more. Often times, surface action will be seen as ladyfish and Spanish mackerel forage on the surface. Fishing on the grass flats should be very good as well. The deep flats will have speckled trout, Spanish mackerel, Pompano, bluefish, ladyfish and other species. Lead head jig’s and live shrimp are the top baits. As in the passes, surface activity will be seen occasionally. This is a good opportunity to cast a shallow diving plug or a 1/2 ounce silver spoon. Snook and jacks will be on the shallow flats in Roberts Bay and in Sarasota Bay. Oyster bars and mangrove shorelines that have a little depth will hold these game fish. Anglers casting artificial lures can cover the water much more quickly and effectively. Search baits such as plugs and weedless spoons are a great choice. The inshore Gulf of Mexico off of the Sarasota beaches can provide anglers with fantastic action when conditions are right in March. Spanish mackerel, false albacore, king mackerel, sharks, and cobia migrate up the coast. They are right behind the huge schools of bait fish such as sardines and herring. When the seas are flat and the water is clear these fish will often feed on the surface. It is very exciting casting into schools of breaking fish. April is a fantastic month to be fishing in Sarasota, Florida! Fish have solidly moved into their spring migration patterns. Severe cold fronts are a thing of the past. There will be fronts move through, perhaps bringing some wind and rain. However, with water temperature in the 70s the bite will be on. Just about every species is available this month. The Sarasota flats are alive with life in April. The deep flats provide excellent action on speckled trout, Spanish mackerel, bluefish, ladyfish, pompano, and more. Anglers drifting and casting lures or live bait do well. Many fish species are in spawning mode this time of year. For the most part, they are aggressive and in a mood to feed. Anglers fishing the shallow flats and backwater areas will do well on snook, redfish, jacks, and larger gator trout. These fish will be found in potholes (depressions in the grass flat) as well as along mangrove shorelines and around oyster bars. Top water plugs are great fun on the high tide stages. Shallow diving plugs, spoons, and jigs are good artificial lures. Large live shrimp fished under docks will produce all these species and more. The passes will be full of fish in April as well. Though the sheepshead will have thinned out as a completed there spawning run. Mangrove snapper and other bottom fish will be available in the structure. However, most of the fish in the passes will be caught by anglers drifting through the pass itself. Pompano, mackerel, bluefish, ladyfish, and more will be caught by anglers drifting jigs and live bait. Action out on the beach will be good early, then tapering off by the end of the month. Spanish mackerel, king mackerel, and false albacore will feed heavily on the beach and out on the artificial reefs. If it has been a warm spring, some tarpon may be showing up by the end of the month. May means one thing to many Sarasota anglers; tarpon! Giant tarpon show up in May off of the Sarasota beaches and stay until late July. Many consider tarpon fish in the ultimate angling challenge. This is a game that requires patience is anglers sit a couple hundred yards offshore in search of fish. Once seen, anglers cast live crabs and bait fish to them in hopes of a bite. It is not easy, but when it all comes together, it is the thrill of a lifetime! Inshore fishing techniques change a bit in May. As the water warms up, schools of bait fish show up on the flats. We transition from casting lures and live shrimp to catching this bait in our cast nets. The bait is then used to chum fish to the boat as well is to catch them. Lures can still be productive, especially early and late in the day. Pin fish become abundant on the flats. That can make using live shrimp a bit frustrating. Snook will be moving in May as well. They will school up in both passes as well as out on the beaches. They do this is part of there spawning ritual. By late May, the rocks in Big Sarasota Pass will be a reliable spot to catch snook. There should also be plenty of fish out on the beach as well. June is a bit of a transition month. It is summer time and it is hot! Anglers fishing the inshore waters get out there early and are done by noon at the latest. Water temperatures will often approach 90°. This is especially true before the afternoon rains calm and cool the water off a bit. Chumming with live bait is the number one inshore technique in June and really all summer long. Bait fish are usually abundant on the beaches and on the shallow grass flats just inside the passes. If the water gets too warm, bait can be difficult to catch. Once the well is loaded, the boat is anchored up and handfuls of bait fish are tossed out in the water behind the boat. If game fish are around, it isn’t long before they are popping the baits. Then it is just a matter of hooking baits on and casting them out. Tarpon fishing is in full swing in June. The periods before the full moon and the new moon are the prime times. Boat traffic is heavy as many anglers are targeting these apex game fish. One nice thing about fishing in June is that with so many anglers out on the beach chasing tarpon, pressure on the inshore species is light. It is hot in July in Florida! However, many clients are surprised to hear that the fish and can be fantastic. The key once again is the abundance of live bait. This is an early bite. Anglers need to be out there first light and done by 10:30 or 11:00. Speckled trout, Spanish mackerel, mangrove snapper, gag grouper, sharks, jacks, ladyfish, bluefish, and other species are attracted to the chum. Snook are still thick in the passes and out on the beaches. Tarpon are still out on the beaches as well, but the numbers are really thinning out. These late-season fish do not show as often. However, they can be a lot easier to catch. Spawning is pretty much done and many anglers have given up the chase. Floating a pin fish or crab under a float out behind the boat will catch them. Once again, this is generally an early bite due to the heat. Sarasota fishing in August is much like it was in July. Action on the deep grass flats should be very good as afternoon rains will have the water temperature down a bit. Bait fish are still plentiful and easy to catch. Chumming with live bait on the flats is a most effective and productive technique. Anglers casting lures at first light will catch fish as well. Sharks show up on the grass flats in late July and August as well. These are the perfect size for catching, between 15 pounds and 40 pounds. The technique is fairly simple; a cut up ladyfish is put under a float and cast out behind the boat. It is then just a matter waiting for a shark to come along. I often do this at the end of a Sarasota fishing charter after we have already experience good action and are looking for a big fish to end the day. Snook will begin moving back in from the passes and off the beaches, though plenty of fish will remain out there. Anglers do well sight fishing for snook in the morning. Tarpon numbers have really thinned out with some of the fish moving into Tampa Bay and North Sarasota Bay. August is one of the best months to target redfish on the shallow flats in Sarasota. Redfish school up in big numbers this time of year. They can easily be seen moving over the shallow flats. A school of reds looks like a small wave going through the water. These fish can be very finicky in the shallow water. Anglers need to be quiet and make long casts in order to catch them. The flats in North Sarasota Bay are particularly productive. September is the most “tropical”month in Sarasota, Florida. It is the time of the year that the hurricanes are most active. That really affects the fishing and can make it unpredictable. When no storms are threatening, fishing can be very good. Also, it is the slowest month of the year in terms of tourist activity That means that the beaches and bays are relatively uncluttered. Water temperature in Sarasota Bay should be in the upper 70s by mid September. Bait fish are still plentiful and chumming continues to be very productive. However, anglers casting artificial lures begin to have more success as the water cools off. Breaking fish will often times be seen feeding on the helpless bait fish. Snook will be moving back into the bays in September. There will still be fished out on the beach and in the passes, but the backwater areas will start to produce decent numbers of fish. The same lures and baits that worked in the spring catch snook and other fish in September. Plugs and soft plastic baits are the top artificial lures. Live pilchards are tough to beat for bait. Schooling reds will still be found on the flats at Long Bar and Buttonwood Harbor. October might be my favorite month to fish in Sarasota Florida! It is cooling off in the weather is usually very pleasant. For the most part, the tropical season is over. Also, between the kids been in school and outdoorsmen turning to hunting, fishing pressure is light. When I can get the bait, I targets snook quite often in October. They are found along mangrove shorelines, under docks, along seawalls, and around oyster bars in Sarasota Bay and Roberts Bay. Chumming with larger live pilchards is extremely effective. Clients also catch them early in the morning casting shallow diving plugs. Redfish and jacks will be mixed in with the snook as well. Anglers drifting the deep grass flats and passes should do well in October. Spanish mackerel respond to the cooling water and are often quite active. Speckled trout, Pompano, blues, ladyfish, and other species school up in both passes and out on the grass flats. There can literally be fish at just about every spot this time of year. The surface action and the inshore Gulf of Mexico should get cranked up by the end of October. Spanish mackerel, king mackerel, false albacore, cobia, and sharks are migrating back south along the Florida coast. This is very similar to the spring fishing. However, because weather patterns are bit more stable, the fall bite is generally a bit more reliable. Spanish mackerel and false albacore in particular will be gorging themselves on the way south for winter. The first real cold fronts of the year will normally arrive around mid-November. Shorter days along with these fronts will have the water temperature dropping. Whatever bait fish that remained on the flats are usually gone by the end of the month. Fish will begin moving around in the bay and preparations for winter. The bite on the deep grass flats can be excellent in November in Sarasota Bay! I’ve normally switched over to fishing primarily with jigs this time of year. Many of the fish are in the 8 foot to 10 foot range. A 1/4 ounce jig is an effective bait for getting down to the fish. Less experienced anglers do well free lining a live shrimp behind the boat. Speckled trout, Spanish mackerel, bluefish, ladyfish, and Pompano are the most commonly caught species. Snook and jacks will begin easing their way back to the creeks and canals. The entrances to these areas are often a good spot to target game fish. Jacks will be schooled up and often seen foraging on the surface. This is great fun as they will eat just about anything cast in front of them. The passes will continue to be productive as long as the water is clean. Pompano are often caught particularly on the outgoing tide with an east wind. Rocks, bridges, docks, seawalls, and other structure will hold mangrove snapper and other bottom fish. A live shrimp fished on the bottom is the best bet. December will find fish moving back to their winter patterns. Cold snaps will have the water in the mid-60s. Snook and jacks will be moving back up into the residential canals in creeks. When the water is clear, action on the deep flats will be good, especially for ladyfish and bluefish. These species do not mind the cooler water as much. Sheepshead will begin to show up in December as well. They are normally caught around oyster bars and under docks all along Siesta Key. They show up in these locations before moving out into the passes. Black drum and other bottom species will be caught as well. Speckled trout will be found on the grass flats when it is warm. However, a big drop in water temperature will have them in the channels and holes. Current Florida fishing regulations are found on the FWC site. In conclusion, I hope to Sarasota fishing calendar helps both visiting and local anglers experience success! Captain Jim Klopfer offers Sarasota Florida fishing charters to visiting anglers. He has been guiding full time since 1991. 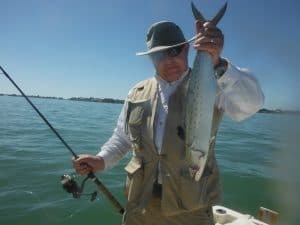 His knowledge of Sarasota Bay and its fish species will help you catch more fish. Capt. Jim runs his charters on a 22” Stott Craft bay boat. Sarasota is a great place for anglers to come and go fishing. Sarasota Bay and the Gulf of Mexico hold many different species. 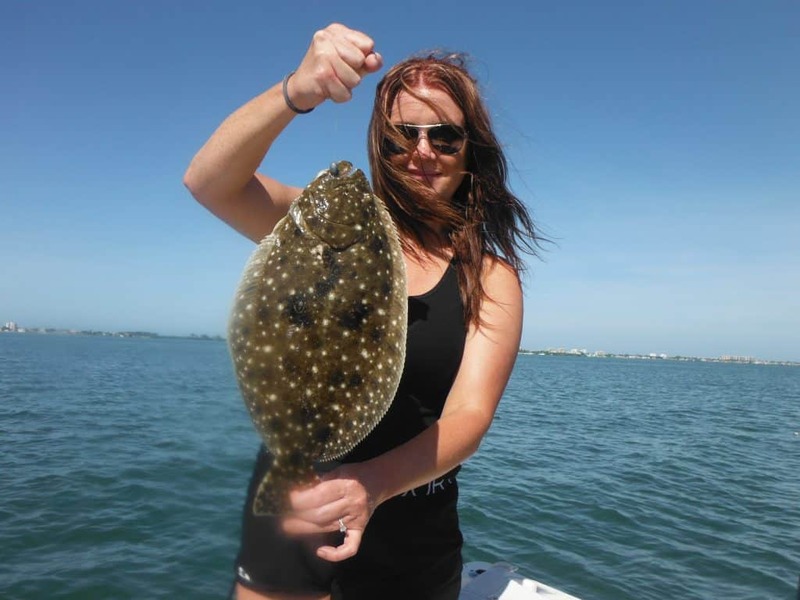 On most Sarasota Florida fishing charters, anglers catch 6 to 8 species. However, it is not uncommon to catch 10 species are more on a four hour fishing charter. 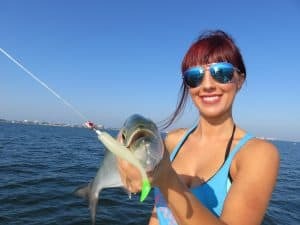 Anglers use a variety of techniques to catch speckled trout, snook, redfish, Spanish mackerel, pompano, bluefish, snapper, grouper, sheepshead, flounder, drum, sea bass, cobia, sharks, and more. Capt. 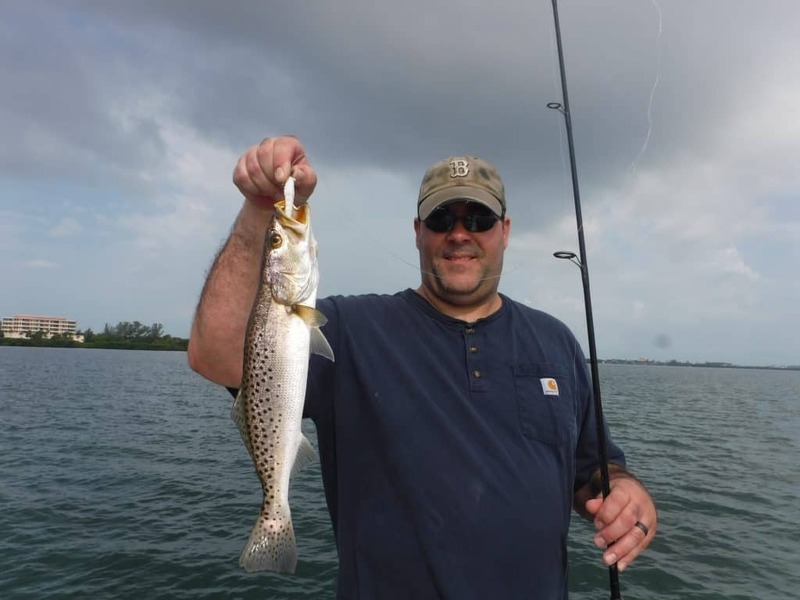 Jim provides all the tackle, bait, and licenses on his Sarasota Florida fishing charters. Spinning tackle is used the vast majority of the time. It is the best choice for most anglers, and is easy for novices to learn to use. Fly tackle will be provided upon request. A cooler with ice is kept on board for drinks and snacks. Many different fishing techniques are used on charters as well. This is advantageous as the trip can then be catered to the angler skill level and experience. Bottom fishing with live shrimp is simple and easy I can be very productive. Drifting live shrimp or live bait fish over the flats produces a lot a fish as well. Both of these techniques can be learned in short order even by the most novice angler. More advanced fishermen may choose to cast artificial lures as the boat drifts along. Jigs are the primary lure that is used on Sarasota Florida fishing charters. It is simple but effective, and catches a lot of fish! 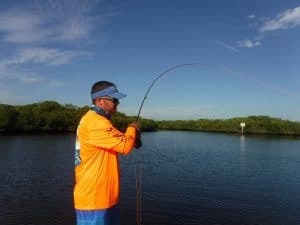 Anglers seeking even more of a challenge can cast jigs and plugs along mangrove shorelines in search of snook, redfish, and jacks. The inshore Gulf of Mexico can provide fantastic action as well. 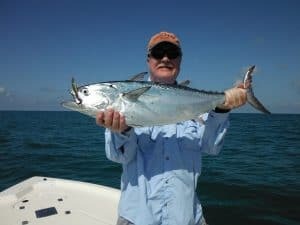 When conditions are right, which means calm seas in clear water, Spanish mackerel, false albacore, sharks, cobia, and a wide assortment of bottom fish are all available within a couple miles of shore. 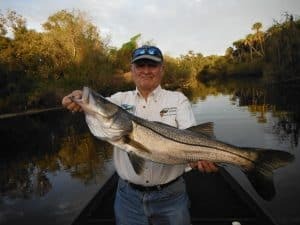 Several area rivers provide advanced anglers the opportunity to catch a trophy snook in the wintertime. Winter fishing is all about the weather. Weather in the winter can vary from gorgeous to downright nasty. On pleasant days, anglers can drift the flats for speckled trout, bluefish, pompano, and ladyfish. Jigs are a great bait as the fish are active in the cooler water. A live shrimp drifting behind the boat will certainly produce as well. Bottom fishing with live shrimp under docks, bridges and around structure is very popular on winter Sarasota Florida fishing charters. This is a great option on breezy days as many of the docks are in protected canals. Big pass is on the lee side of Siesta Key on a hard south wind. Sheepshead, snapper, grouper, flounder, and black drum will take a live or frozen shrimp fished on the bottom near some type of structure. Snook and jack crevelle will migrate up into residential canals, creeks, and area rivers. This results in the fish being concentrated in a relatively small area, and thus are easier to locate and catch. Capt. 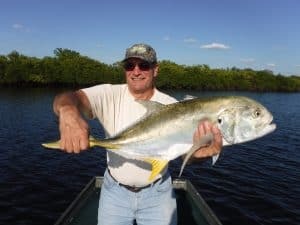 Jim offers River fishing charters to the Myakka River, Manatee River, and Braden River. He is the only one offering these types of Sarasota Florida fishing charters. This trip is best for experienced anglers. Like most fisheries, spring is an excellent time to go fishing. Rising water temperatures have the fish moving out of deep water and up onto the flats to feed. Many fish spawn in spring and feed heavily before they do so. Spring also brings migratory species such as Spanish mackerel, false albacore, cobia, and Pompano to the area. The deep grass flats of Sarasota Bay will be very productive in the spring. Lush submerged vegetation will hold shrimp and bait fish, which in turn will attract the game fish. Speckled trout fishing is at its peak in late spring. Live shrimp and jigs are equally productive. Spanish mackerel, bluefish, Pompano, ladyfish, jacks, cobia, and other species will be taken on the grass flats as well. The two passes connecting Sarasota Bay with the Gulf of Mexico can be teeming with fish and spring. These passes are migration routes for fish moving in and out of Sarasota Bay. Ladyfish are generally very plentiful in the passes. Pompano, Spanish mackerel, bluefish, and other species are caught as well. A jig bounced along the bottom from a drifting boat is very productive. Snook, redfish, and jacks will be targeted by experienced anglers on the shallow flats. Grass flats, oyster bars, and mangrove shorelines and water from 2 feet deep to 5 feet deep will hold these game fish. Jigs and live shrimp work best for redfish. Plugs are a great artificial lure to use to locate snook and jacks on a large flat. 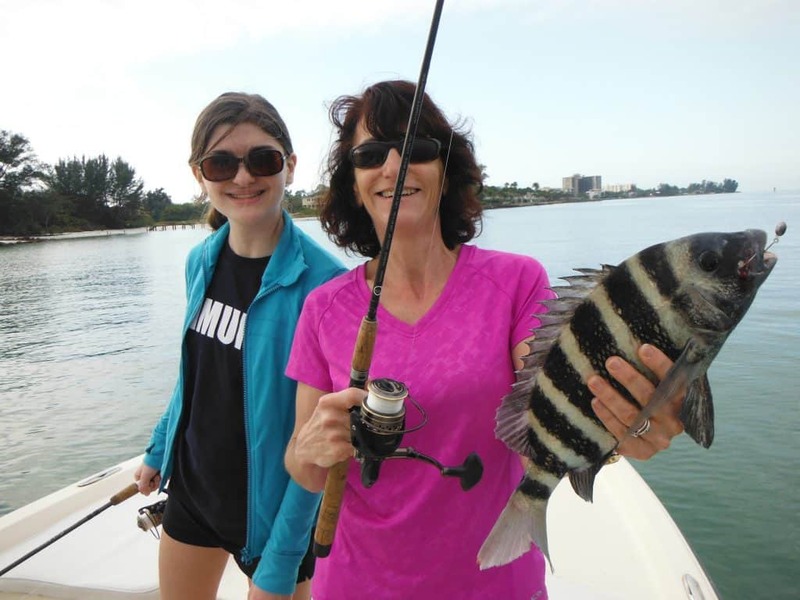 Summer is a great time to fish in Sarasota! Anglers are often surprised to find out that summer offers the fastest action of the year in terms of number and variety. The key to this great summer fishing on Sarasota Florida fishing charters is the abundance of live bait. Hordes of small shiny baitfish cover the shallow flats, especially those near the passes. Charter boat captains use a special technique this time of year called “live bait chumming”. It requires a lot of live bait. A cast net is used to procure 500 or so frisky live baits. They are put in a large well with a recirculating pump. The boat is then anchored on a likely flat and a few handfuls of live bait fish are tossed off the stern. If game fish are around, it won’t be long before there taking advantage of the free meal. Hooked baits are then cast in and it is “game on”! However, it is very hot so this is an early-morning game. Clients meet at the docket first light and are usually back home by late morning. Summer also offers visiting anglers a special thrill, the chance to catch a giant tarpon! These fish move into the area in mid May and stay until mid July. Tarpon average 75 pounds and fish to 150 pounds are not uncommon. This is big-game fishing and is an unpredictable. There will be days when no fish are hooked. This is definitely a charter for more experienced hunters and fishermen. Snook will school up in the passes and out on the beaches in the summer as well. The rocks in Big Sarasota Pass on the north end of Siesta Key are a particularly good summer time snook spot. Live bait works best in this situation. However, artificial lures and flies are the baits of choice when site fishing for snuck on the area beaches. Fall is a great time to visit Sarasota, Florida. By mid October it has started to cool off a bit. Shorter days and falling water temperatures get the fish moving as a are transitioning into their fall and winter patterns. By this time, chances for a tropical storm are low in the weather is usually very reliable. Also, tourist traffic is light, which means hotels and restaurants are not crowded. When conditions are right and the bite is on, I spent a lot of time in the inshore Gulf of Mexico and the fall. Site casting to schools of breaking false albacore is fantastic sport on light spinning tackle or on fly. These diminutive tuna fish make long, fast runs and will test the tackle. Spanish mackerel, sharks, cobia and other species are mixed in as well. Sarasota Bay offers visiting anglers excellent action and the fall as well. Snook have moved from the beaches in the passes back inside. They are found in the normal spots, docks, mangrove shorelines, oyster bars, and flats. Outgoing tides early and late in the day our prime times to catch them. Jacks and redfish will be taken as well. Both the passes and deep grass flats should provide steady action for clients on Sarasota Florida fishing charters as well. Grass flats in from 6 feet of water to 10 feet of water will hold the majority of species. Speckled trout, Spanish mackerel, bluefish, Pompano, ladyfish and other species will be taken. Pompano are targeted in the passes on the outgoing tides in the fall. The majority of fish caught on Sarasota Florida fishing charters are taken on the deep grass flats in Sarasota Bay. These are submerged weed beds in water between 5 feet deep and 10 feet deep. These are fertile environments which hold bait fish, shrimp, and other crustaceans. The abundance of forage attracts the game fish. The deep grass flats are fished in two ways; drifting in anchoring. Drifting is the preferred technique when anglers are searching for schools of fish. Jigs are cast ahead of the drifting boat while a live shrimp or bait fish is free lined behind the boat. Often times, both methods are employed at once. This is a very effective strategy. Once fish are located, the boat can be anchored. Anglers can then thoroughly work the area, maximizing the bite. Once the bite slows, the anchor is picked up and the drift is resumed. Another option is to continue the drift then motor back around slowly and re-drift the productive area again. Anchoring can also be very effective on the deep grass flats. This is done when live bait chumming and also when anchoring on the edge of a flat. Chumming will draw the fish up behind the boat so there is no need to drift. Fish often relate to edges. Therefore, anchoring on the edge of a flat where it drops off into deeper water can be very productive. For the most part, anglers anchoring on the grass flats will use live bait. Anglers fishing the shallow grass flats will often catch the largest fish. This may seem backwards, however, the larger fish are loners and will often be found in water that is to feet deep to 4 feet deep. Redfish school up in these shallow waters. Large speckled trout will take up residence along and oyster bar or in the deeper hole. Snook will be found along the edges of bars and mangrove shorelines. For the most part, anglers fishing the shallow flats are giving up numbers in search of quality. Patience is required as there is often a lot of water to be covered in order to find the fish. Many times the fish are loners or scattered out as opposed to encountering schools. Artificial lures are usually chosen as they allow anglers to cover the water effectively. Plugs, spoons, and jigs are all good choices. As mentioned earlier, passes connect Sarasota Bay with the Gulf of Mexico. A pass is an inlet, it is just the term used in the Gulf of Mexico as opposed to the Atlantic Ocean. Big Sarasota Pass and New Pass are the two passes in Sarasota. Longboat Pass to the north separates Longboat Key and Anna Maria Island. Big Pass is a great fishing spot that will hold fish all year long. There is a plethora of structure on the entire north side of Siesta Key in Big Pass. Concrete seawalls, riprap, docks, and submerged rocks and ledges hold large numbers of sheepshead in the late winter and spring. Mangrove snapper and gag grouper can be found all year long. Snook will hold in the structure in the summer time as well. The key to the spot is the abundance of structure along with the deeper water, up to 25 feet deep. Plenty of fish will be caught in the pass itself, particularly ladyfish. These hard fighting rascals are great fun on light tackle and are a perfect fish for novice anglers to practice up on. They are very cooperative and aggressive. They leap high up out of the air when hooked. Pompano, bluefish, jacks, and Spanish mackerel will also be taken regularly. Vertically jigging from a drifting boat is an excellent technique when fishing the passes. It is also very simple and easy for novice anglers to do. The jig is simply let down to the bottom, then the bail on the reel is closed. As the boat drifts along, the jig is hopped sharply up off the bottom a foot or so. Then, is allowed to fall back to the bottom. This action closely mimics a fleeing crab or shrimp and is very effective. Anglers can drift with live bait as well. Breaking fish will often be seen in the passes. Bird activity will often give their location away. Once the angler gets closer, it is easy to see the fish feeding aggressively on the surface. This is great fun as just about lure or bait that remotely resembles the prey will get eaten. Jigs, spoons, and plugs are all productive lures. Docks and bridges are fish magnets. They provide shade, structure, and hold forage. These are all the things a fish needs. There are many docks in the area, and not all will be productive. Capt. 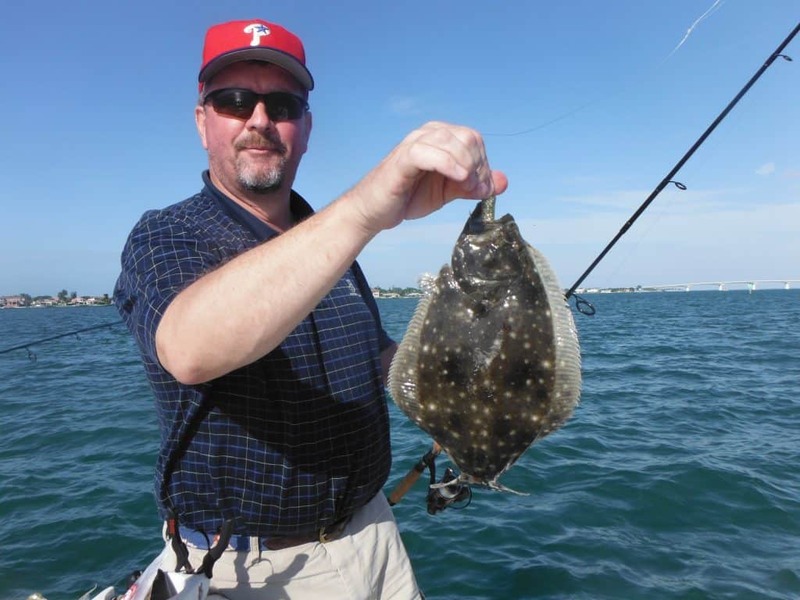 Jim has learned which once produce on his Sarasota Florida fishing charters. Live bait is most often used when targeting fish under docks and around bridges. Live shrimp are used most of the year and are an extremely effective bait for a variety of species. In the summer time, a switch to live bait fish is more productive. Pin fish can be sick in the summer time and are a nuisance, nibbling the shrimp off of the hook. Anglers can also fish docks using artificial lures. Plugs are a great choice as I don’t hang up on the bottom and allow anglers to cover a lot of water in a relatively short amount of time. These plugs will fool snook, jacks, redfish, snapper, and more. Fishing lighted docks and bridges at night is a very productive technique for catching snook. The lights attract plankton which then attracts small a bait fish and shrimp. The snook and other game fish are then attracted to the bait. Anglers fish the shadowy area where the light turns to dark. An outgoing tide is considered best. This is a great way to beat the heat in summer time. Trout, snapper, bluefish, and ladyfish will be caught as well. Clients fishing the inshore Gulf of Mexico can experience some world-class fishing in the spring and again in the fall. Pelagic species such as Spanish mackerel, king mackerel, and false albacore migrate up the coast in the spring and back down the coast in the fall. They migrate with the schools of glass minnows and other bait fish. They are often seen aggressively foraging on the surface. We call this “breaking fish”and it is very exciting! Jigs, spoons, small plugs, and flies are all very effective. Live bait will work, but there generally is no need to use them with lures being so effective. Most of this action will take place from several hundred yards offshore to 2 miles or so. Anglers simply cruise around looking for signs of fish. There are three artificial reefs right off of Lido Key. On days when surface activity is difficult the fine, these can be excellent backup spots. Those artificial reefs also offer anglers excellent bottom fishing all year long. Large sheepshead will be caught in late spring. Mangrove snapper and gag grouper are present all year long. Flounder are taken sometimes in the winter. Grunts can provide action at any time. Live or cut bait fish on the bottom will produce the bottom species for anglers looking for a fresh fish dinner. Trolling can be a very effective technique in the inshore Gulf of Mexico as well as in Sarasota Bay. Trolling is very well suited for the open Gulf. While casting to breaking fish is preferred, there are times when the fish just do not show. This is when trolling can save the day as it takes the lures down to where the fish are. Trolling also allows Capt. Jim to cover a lot of water in a short amount of time on his Sarasota Florida fishing charters. Trolling works very well for Spanish mackerel and king mackerel in particular, but will catch false albacore and other species as well. Fly fishing is something many visiting anglers enjoy. Saltwater fly fishing is a bit different from fishing in freshwater trout streams. The primary difference is that saltwater fly anglers need to be able to cast about 40 feet or so in order to regularly catch fish. However, this is fairly easy to do with modern fly equipment. Any fish that will take a jig or other artificial lure can be caught on fly. The number one fly in this area, as it is in many other areas, is the Clouser Minnow. This fly will sink down on the deeper flats and closely resembles a shrimp or small bait fish. Speckled trout, ladyfish, bluefish, mackerel, jacks, and more are caught on the deep flats. Spanish mackerel and false albacore will most certainly take a fly out on the beach. When these fish are actively feeding, they will readily take a well presented fly. On some days, flies will actually out produce lures. False albacore in particular can be very fussy when they’re focused on tiny glass minnows. A fly is a better invitation for these than any lure. 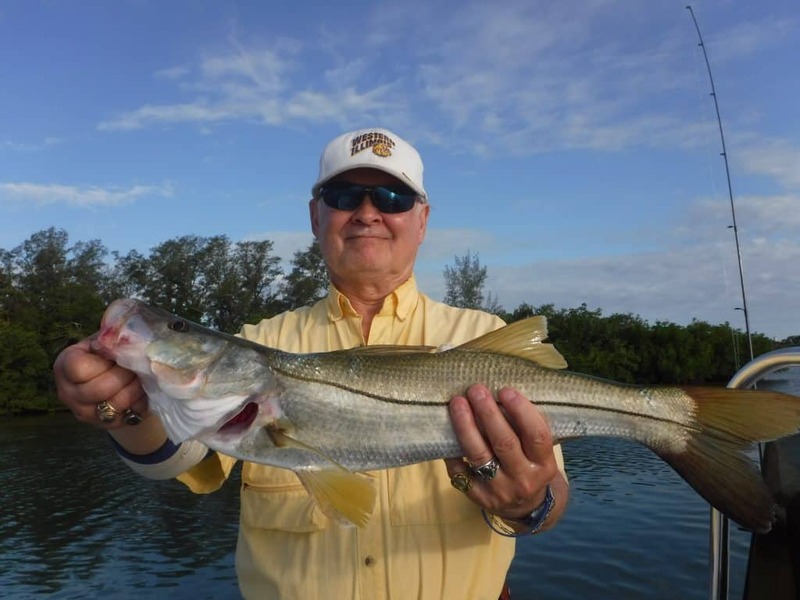 Anglers seeking a different experience may like a River snook trip. Snook migrate up into residential canals, creeks, but most of all area rivers in the winter. They do this to escape the extreme temperature changes on the shallow flats. The Manatee River, Braden River, and Myakka River all hold good populations of snook in the winter. Jack crevelle, redfish, juvenile tarpon, and other species will be caught in these locations as well. These are brackish rivers. This means that they are tidally influenced but have a low salinity level. Largemouth bass, catfish, and other freshwater species will inhabit the same areas as the snook will. The combination of the scenery, species available, and the opportunity to land a trophy snook make this a unique angling experience. Rapala plugs are used on the vast majority of river charters. These lures allow anglers to cover a lot of water while inducing reaction strikes. This results in the fish coming out of the cover to attack the bait, giving anglers a better chance to land the fish. Strikes are often times ferocious and sometimes right at the boat! This trip does require patience and decent casting skills. It is best for experienced anglers. 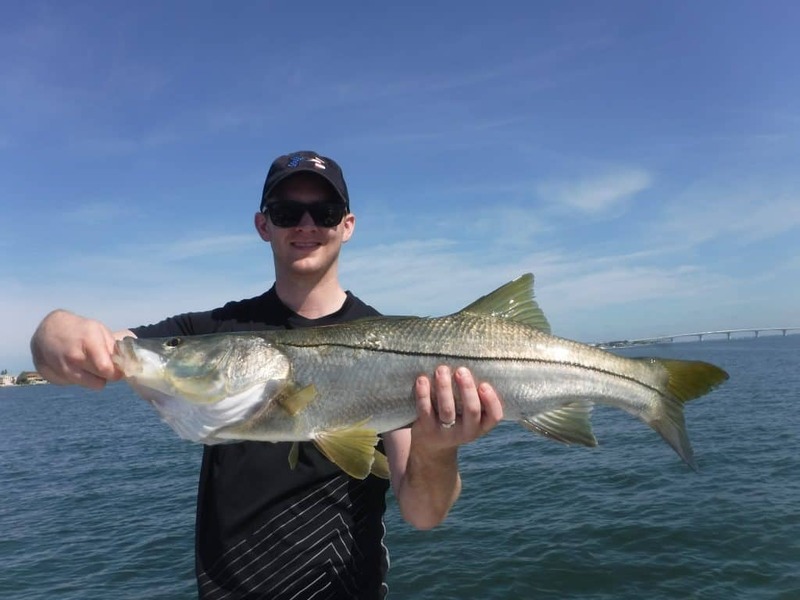 Snook are the premier inshore game fish in Florida. Sarasota has a decent population of snook. They are basically a saltwater version of the largemouth bass. Snook are ambush predators. They have a largemouth in a wide, broad tail. They are built for short bursts of speed to either attack a bait or elude a predator. Snook have a distinct seasonal migration. They winter in creeks, canals and rivers. As it warms up, they move out to the open flats and scatter out and feed. By summer time they have moved into the passes and out on the beaches to spawn. As fall arrives, the migration pattern reverses itself in the fish move back into Sarasota Bay and eventually back into the creeks and canals by winter. Snook can be taken by just about every angling technique. Live bait such as shrimp, pin fish, grunts, and pilchards are extremely productive. Snook will also take artificial lures such as plugs, jigs, spoons, and flies. Snook are nocturnal and anglers seeking fast action will fish the lighted docs and bridges at night. Anglers can view current fishing regulations on the FWC site. 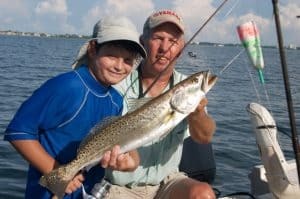 Speckled trout are probably the most popular inshore game species in Sarasota and the entire Gulf Coast. 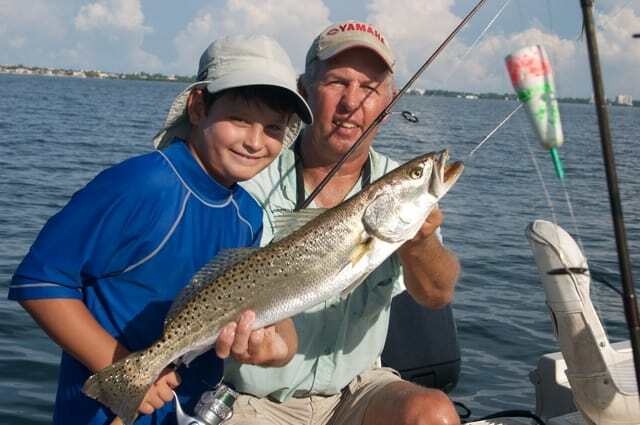 Speckled trout are numerous, aggressive, take lures and live baits, and taste great. They are the perfect charter fish! While not the greatest fighters in the sea, they put up a decent tussle on light tackle. Anglers seeking numbers of fish will do well to target the deep grass flats. Submerge grass beds and 4 feet of water to 10 feet of water will hold good numbers of speckled trout. Fish generally school up by size. Once anglers start catching fish, most of them will be of a similar size. If a school of smaller fish is located, it is best to move on. At some point, patient anglers will find some decent sized fish. It would be easy to argue that a live shrimp under a popping cork has resulted in more speckled trout being caught than all other live baits and lures combined. It is an extremely effective technique for catching trout and other species. A special cork is used. It has a concave face on the top. When twitched, it causes a “popping”noise. This simulates feeding fish and will draw trout and other species to the helpless shrimp. Bait fish and artificial shrimp can be used under a popping cork as well. The jig and grub combo has resulted and many speckled trout for Sarasota anglers. Capt. Jim uses the jig and grub combo extensively on his Sarasota Florida fishing charters. They are very effective and it is an easy bait for novice anglers to learn to use. The jig casts well in the Shad tail has a good built in action. Jigs worked over the deep grass flats will produce ladyfish, bluefish, Spanish mackerel, Pompano, grouper, snapper, and other species. Redfish are extremely popular all along the southeast part of the United States. Fishing tournaments that target redfish occur in all southern states. While Sarasota Bay does have some redfish, the numbers aren’t as great as Tampa Bay to the north and Charlotte Harbor to the south. Both of those areas have much larger areas of expansive shallow grass flats. Redfish in Sarasota are caught two different ways, under docks and on the shallow flats. Many redfish are caught by accident by anglers targeting other species using live shrimp under docks and along mangrove shorelines. This is especially true in the cooler months. 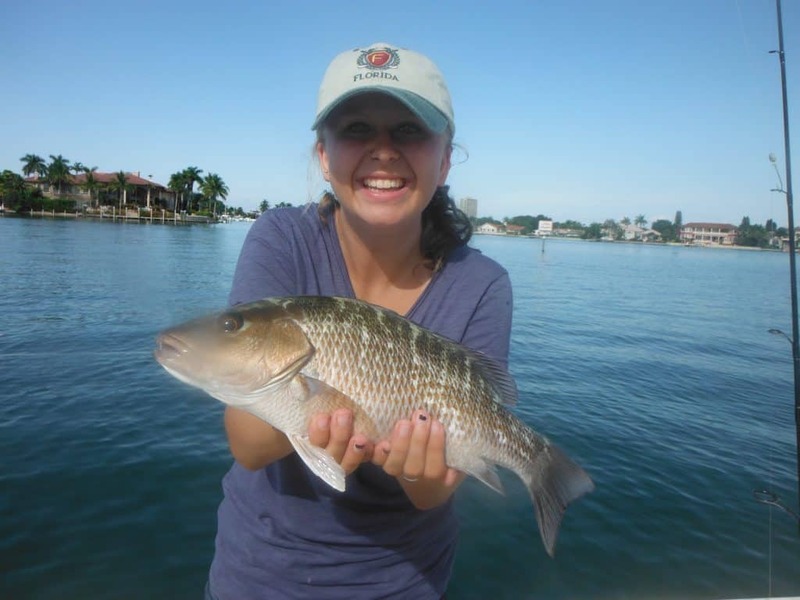 Redfish will be caught in the same locations as sheepshead, black drum, snook, and other species. Many anglers prefer the challenge of site casting to redfish in shallow water. This requires stealth, patience, and determination. Redfish in shallow water are very spooky. It can be quite frustrating to cast over and over to fish that will not take the bait. But, as that is part of the challenge, it is also part of the reward when a fish is caught. Most anglers use artificial lures such as we list spoons and soft plastic baits. They allow anglers to cover a lot of water in search of redfish. 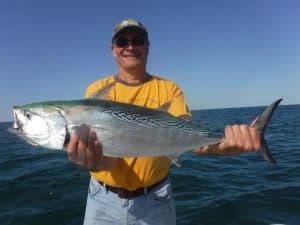 Spanish mackerel are a terrific and underrated game fish! 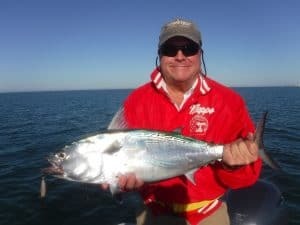 Mackerel fight hard, make blistering runs, hit artificial lures, flies, and live baits with reckless abandon, and when eaten fresh are terrific eating. Some years Spanish mackerel can be caught all season long. But, generally speaking, spring and fall are the best times to catch them. Spanish mackerel will be caught and both passes and on the deeper grass flats near those passes. Mackerel will oftentimes be encountered in water slightly deeper than trout and other species. Grass flats and 8 foot to 10 or 12 foot of water are prime spots. Spanish mackerel will often be seen working on the surface. This is true on both the flats and in the passes. The best Spanish mackerel action in Sarasota usually occurs in the inshore Gulf of Mexico. Clients on Sarasota Florida fishing charters experience fantastic action when conditions are right. When the water is calm and clear, bait fish will be thick several hundred yards off the beaches. This in turn will attract Spanish mackerel, false albacore, ladyfish, and other species. Anglers casting lures, flies, and baits into the schools of bait or to schools of breaking fish will have success. Trolling works well on days when the fish are not seen on the surface. 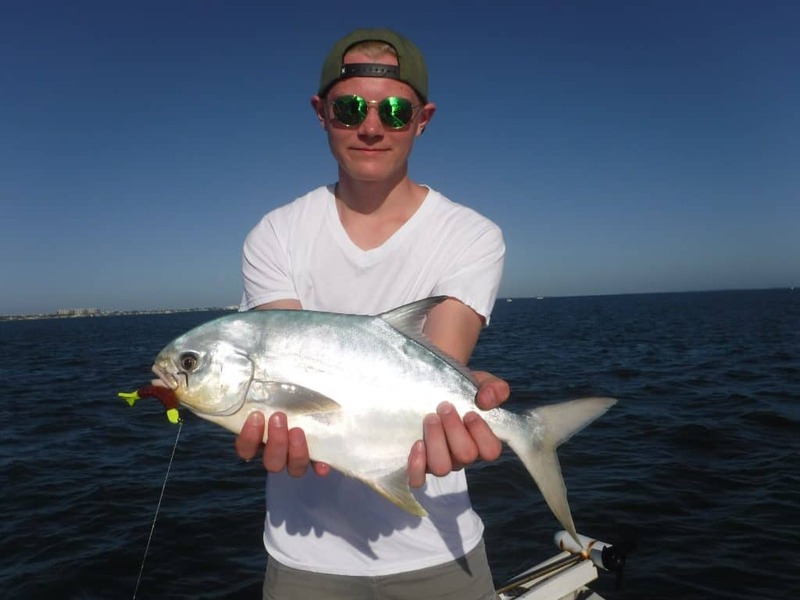 Pompano are a hard fighting and very desirable little fish that resembles the permit. Pompano are found in Sarasota Bay, though they are an intermittent catch. They put up a tremendous fight for their size, however they are prized for their delicious flesh. Pompano are one of the finest eating fish that swims. 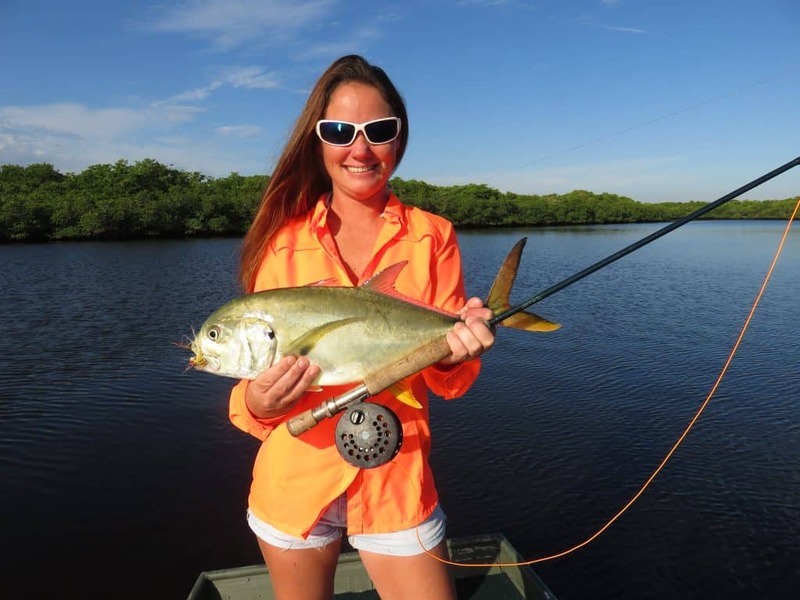 Pompano are caught in the passes, on the deep flats, and off the beaches. 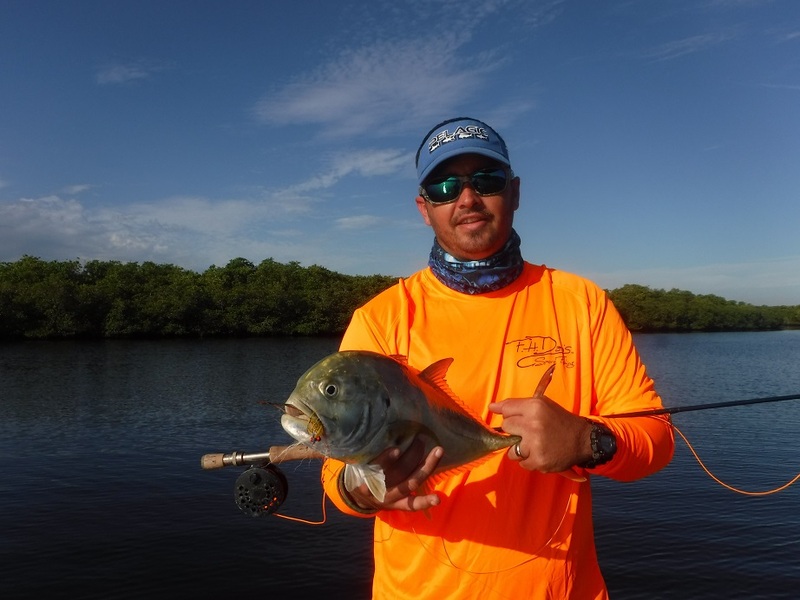 Anglers targeting pompano use special jigs called “pompano jigs”. These are small, compact little lures that mimic the small crabs that Pompano feed on. They have a smaller hook and shorter dressing than the larger jigs used for trout on the deep flats. Anglers cast them while drifting over the grass flats or vertically jig them while drifting in the passes. Surf anglers catch them casting jigs and using live shrimp and sand fleas. Jack crevelle, or “jacks” for short are one of the hardest fighting fish in Sarasota. Jacks are the bar room brawlers of inshore fishing. They are mean and nasty! Jacks user broadsides and large Fort tails to pull incredibly hard. Jacks readily take artificial lures and flies along with live bait. They are not good to eat. Jacks oftentimes school up in large numbers. This is a factor in their aggressiveness, as competition among the other fish takes hold. Jacks will be seen foraging on the surface. Anglers will sometimes find them milling just below the surface as well. 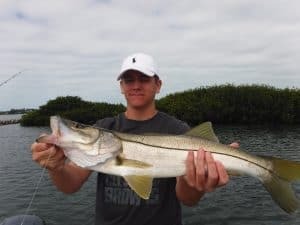 Anglers blind casting for snook regularly hook jack crevelle. Capt. Jim loves throwing plugs when targeting jacks. The take can almost jerked the rod out of the anglers hand! Shallow diving plugs work very well when targeting jacks and rivers and canals. The jig and grub combo falls plenty of jacks on the open flats as well is when they feeding aggressively on the surface. Some of the largest jacks caught on Sarasota Florida fishing charters are done so on River snook trips. Northern anglers are quite familiar with bluefish. They inhabit the entire East Coast from Maine down to Florida and around to Texas. The bluefish that we have in Sarasota Bay average 2 pounds and a 5 pound bluefish is a nice one. However, they are great sport on light tackle. Blues are very aggressive and pull extremely hard for their size. Smaller ones are decent eating when bled out, immediately put on ice, and eaten that day. Most of the bluefish caught by Sarasota anglers are done so accidentally while targeting other species. Like pompano, bluefish tend to favor the deeper grass flats. Submerge grass and 10 feet of water is ideal. Jigs are effective bait for catching bluefish as a can be cast a long way and will sink down in that depth of water. Most bluefish are taken by anglers casting artificial lures, though they will certainly take a live bait as well. The deep flats near the passes and the passes themselves are the prime spots. Ladyfish are disparaged by some anglers because they are not good to eat. This is a shame, as ladyfish put up a great fight on light tackle. They are aggressive, pretty, take lures flies and baits, and leap high into the air when hooked. 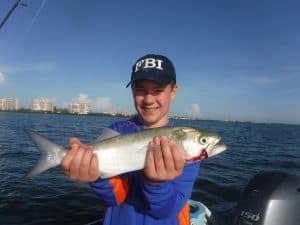 Ladyfish are often targeted on Sarasota Florida fishing charters when children and novice anglers are on board. Ladyfish school up, often times in huge numbers. It is not uncommon when encountering a school of ladyfish to have every angler hooked up at once. It gets a bit exciting when for anglers are fighting for fish at the same time! The deep grass flats throughout Sarasota Bay along with both Big Sarasota Pass and New Pass are prime spots. Ladyfish will often be found schooling out on the beach as well. Sheepshead are a member of the porgy family. They are a structure oriented species that is found under docks, on rocky bottom, around seawalls, and on oyster bars. They are rarely taken on artificial lures. Sheepshead are crustacean feeders and are caught by anglers using live shrimp, fiddler crabs, oyster crabs, and sand fleas. These saltwater panfish are very good eating but the large rib cage can make them difficult to clean. 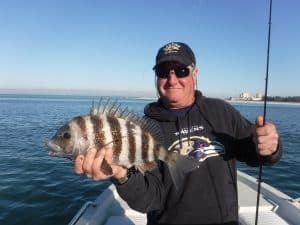 Sheepshead show up in Sarasota Bay around Thanksgiving. However, their numbers increased dramatically around the end of January, when they begin their spawning run. They are generally sick in the passes, on the inshore artificial reefs, and around docs and bridges near the passes until late March. Sheepshead are great fun and provide both action and meals for clients on Sarasota Florida fishing charters. One great aspect of this fishery is that anglers do not need to be great casters in order to achieve success. This is particularly true when they are schooled up in the passes. A hook baited with a shrimp and drop to the bottom will fool them. Mangrove snapper are often considered and offshore species. However, they are plentiful in Sarasota Bay and on the inshore artificial reefs. Snapper are taken all year long. Mangrove snapper are delicious eating and are prized by both local and visiting anglers. Most the snapper are taken by anglers using live bait or frozen bait. However, anglers fishing with Capt. Jim have caught many snappers casting artificial lures as well. Mangrove snapper are caught around structure in Sarasota Bay all year long docs, bridges, oyster bars, and other structures will attract and hold them. Mangrove snapper also school up on the deep grass flats in the summer. They respond well to live bait chumming. Some of the snapper caught on the open flats are very nice ones, up to 18 inches. July and August are the top times to catch the flats snappers. Ledges and areas of hard bottom in the inshore Gulf of Mexico hold a lot a snappers as well. This includes the artificial reefs just off of Lido Key. There is an area of coral bottom to miles off of old Midnight Pass as well. Anglers using light tackle, light leaders, lightweights, and small hooks will have more success is mangrove snapper can oftentimes be line shy. Grouper are another species most anglers associate with offshore fishing. However, quite a few gag grouper are caught inshore as well. Red grouper are less common inshore. Gag grouper are caught in the cooler months by anglers fishing for sheepshead. It is not unusual to hook a large grouper that the angler cannot control. Structure such as seawalls, docks, and bridges will hold gag grouper inshore. Most grouper in the cooler months are caught by anglers using live bait. Gag grouper are caught on the open grass flats as well in the late summer. This is part of an annual migration as grouper in the 10 inch to 16 inch range migrate into the Gulf of Mexico. These fish can be caught quite plentiful on the grass flats near the passes. They are caught on live bait but will readily take a jig and grub as well as other artificial lures. Tarpon, also known as the Silver King, are the ultimate game fish. Anglers have very few opportunities in the entire world to sight cast to fish of 150 pounds using spinning tackle or fly rods. Most fish of that size are caught by anglers trolling or bottom fishing with heavy tackle. Experienced anglers are best to target tarpon on Sarasota Florida fishing charters. The run of giant tarpon begins in Sarasota in early May and peaks in mid June. 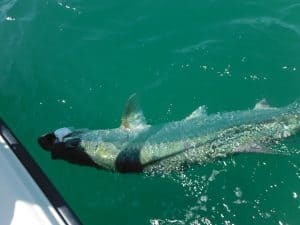 Tarpon will be around until late July, though angling pressure thins out dramatically after the Fourth of July weekend. By that point it is also awfully hot. The week before the full moon in May and the full moon in June are the peak times to target tarpon. This is not a game for the faint of heart. Tarpon will test both the tackle and the angler. Anglers sit several hundred yards off the beach and scan the water for signs of fish. Tarpon will be seen in groups rolling and milling about on the surface. The direction and speed of the fish are judged and hopefully the boat is put in position for an opportunity. This is as much hunting as it is fishing. It is not easy as everything must come together. False albacore are a pelagic species that are found off of the Sarasota beaches in the spring and again in the fall. They are a terrific game fish! They are basically small tuna fish and are extremely fast. False albacore will make a long initial run. Often times, anglers will need to fire the boat up and chase it down. One of the most exciting aspects of false albacore fishing is that so often it is visual. The fish are targeted as they forage aggressively on the surface. Small plugs, jigs, and flies cast into the melee will fool them. False albacore can be fussy at times, patience is required. They are not considered good to eat. Cobia are a migratory species that cruise the coast lines. Anglers can often sight fish them in clear, calm water. They will also congregate over artificial reefs and ledges. 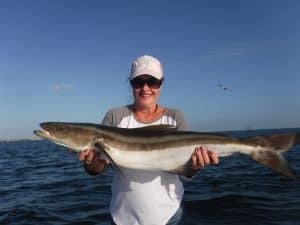 Cobia to come into Sarasota Bay and will put up a great fish on light tackle. Cobia grow very large, up to 100 pounds. They are fantastic eating. Most cobia landed in Sarasota Bay are accidental catches. Jigs produce plenty of cobia, but they will certainly take a live shrimp or bait fish. Pinfish in particular are great baits. Anglers targeting them in the inshore Gulf catch them trolling and bottom fishing with live bait. Flounder are in incidental catch for most anglers on Sarasota Florida fishing charters. They are caught near structure such as docks, bridges, bars, and ledges. In these locations, most fish are caught by anglers using live bait. Flounder are caught on jigs when drifting the flats as well. Flounder are fantastic eating! 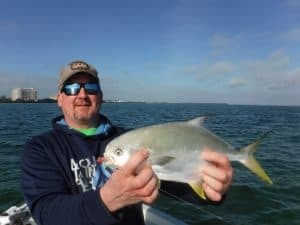 in conclusion, anglers thinking about taking out Sarasota Florida fishing charters can expect action, variety, and a great day out on the water with Capt Jim Klopfer.